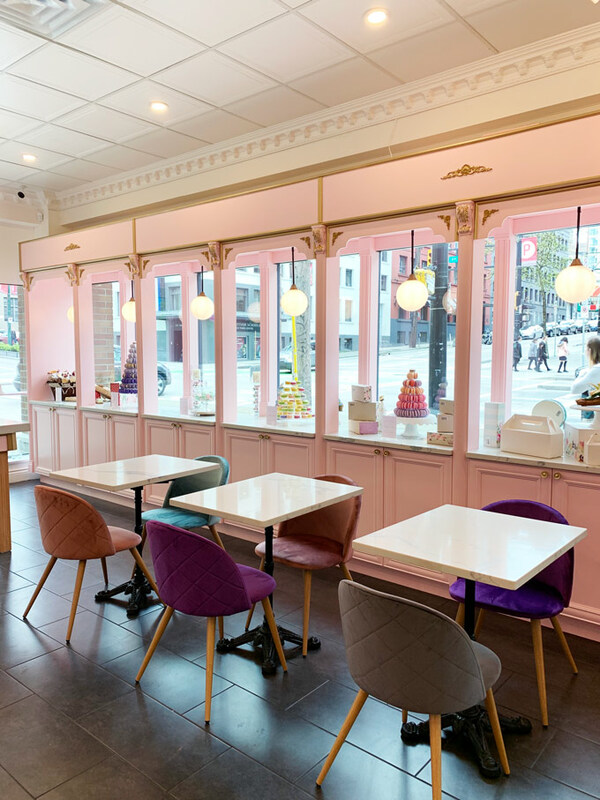 I love my French pastries and desserts, so I had to check out the newly opened Le Cassis Pâtisserie in Downtown Vancouver. 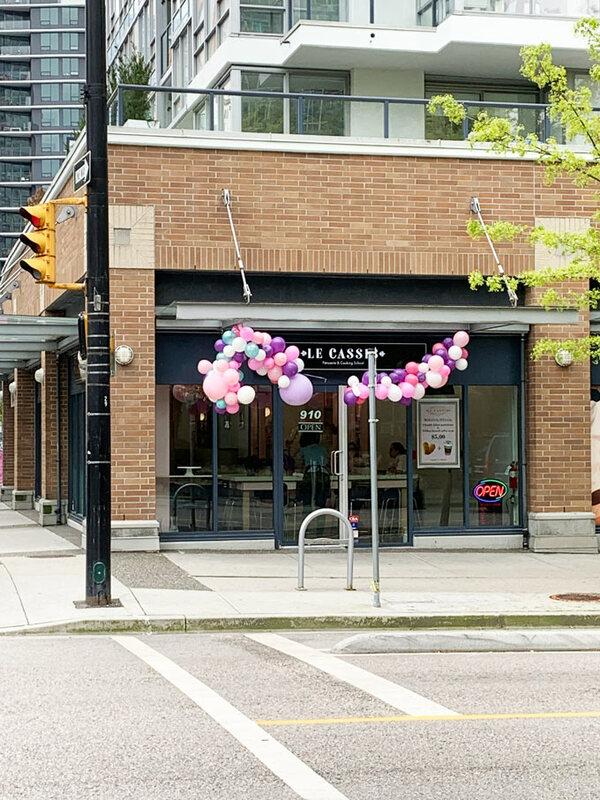 Le Cassis opened just two weeks ago at 910 Beatty St and is part-bakery cafe as well as a cooking school. 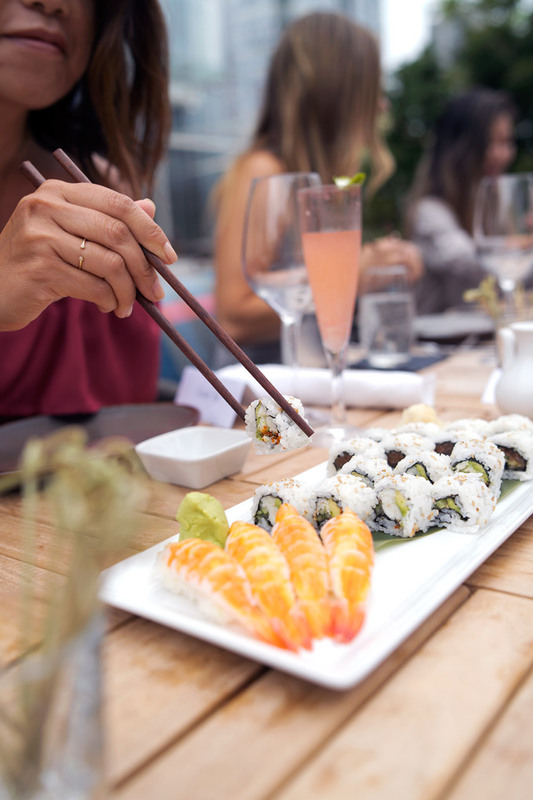 According to their website, Le Cassis is chef-owned and operated by Chef Hoda Shoghi who trained at Le Cordon Bleu in Paris. 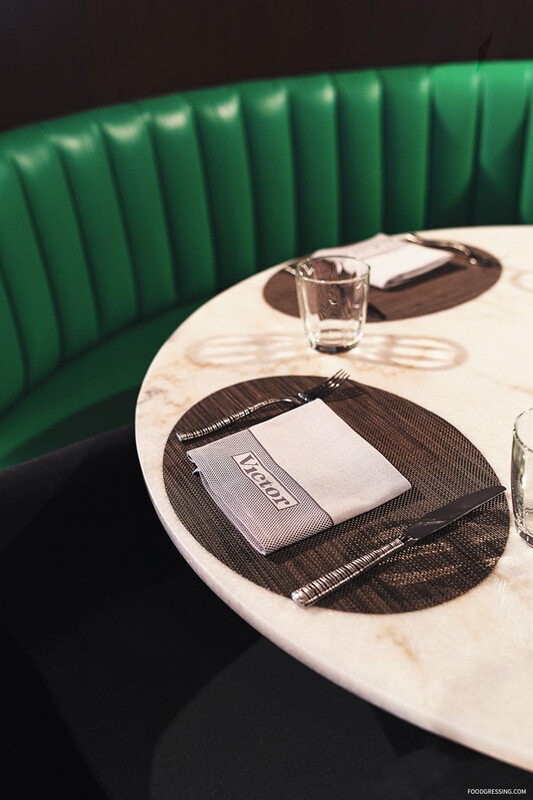 The interior of Le Cassis certainly coasts a touch of Paris with pastel colours, colorful armchairs, an overhanging chandelier and a banquette at the back the shop. 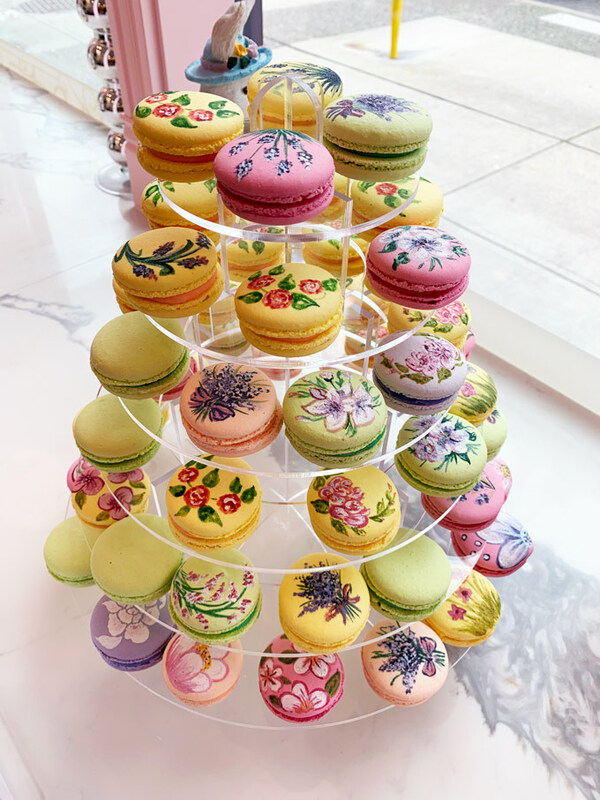 The space along the window showcased many of their macaron towers with delicate, beautiful and intricately designed macarons. 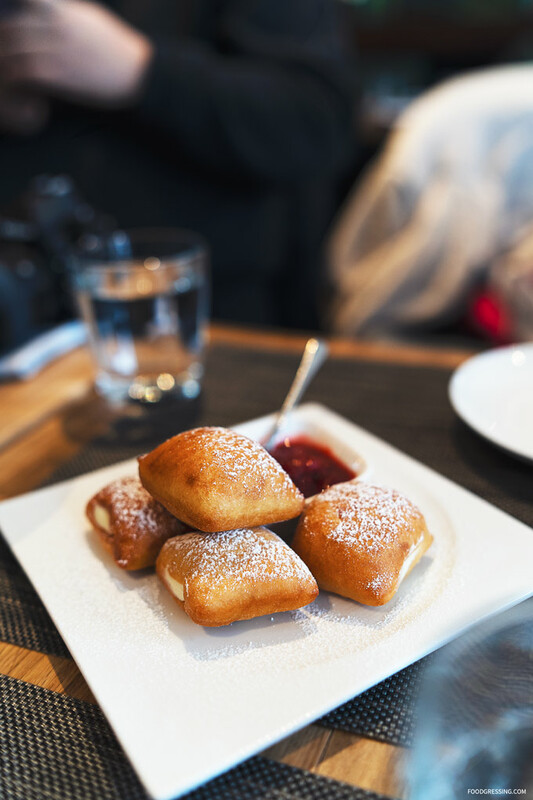 On the menu at Le Cassis are French pastries, freshly baked baguettes, viennoiseries, croissants, danishes, macarons and so forth. 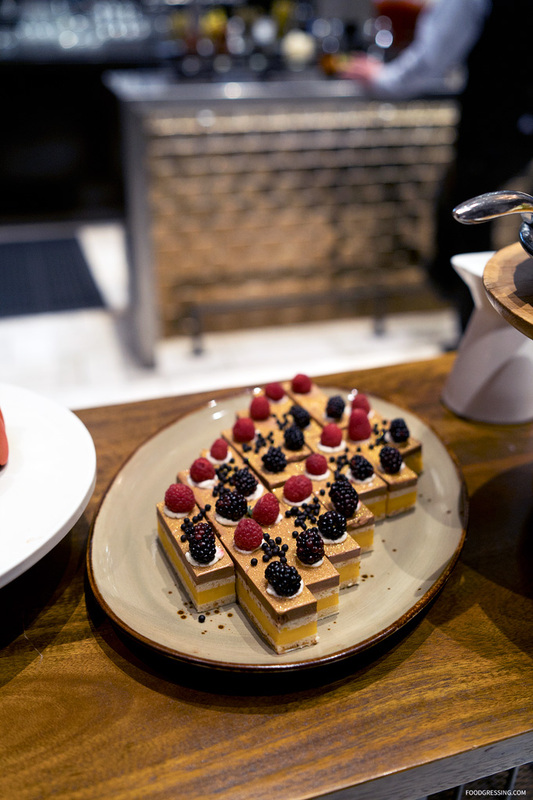 They also offer espresso-based drinks and teas to accompany your treat. The coffee they coffee is from Mogiana Coffee. In terms of pricing, I did find their pastries a bit on the expensive side for the size but perhaps fair for being in the Downtown core. 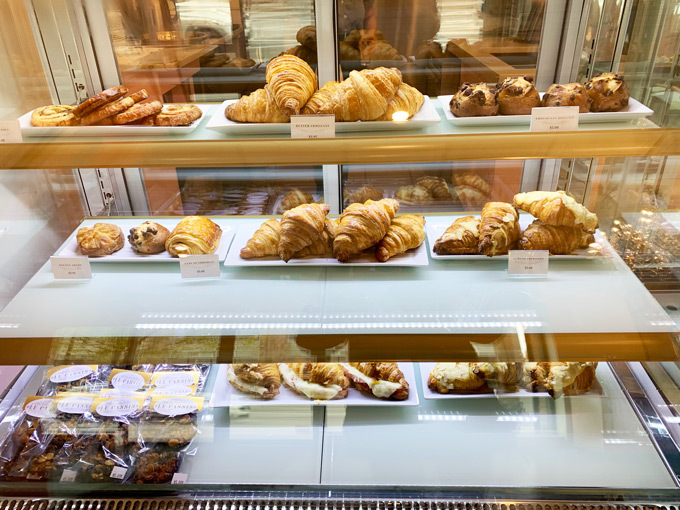 For example, their regular croissant is $3.95 (versus ~$3.25 elsewhere), Pain Au Chocolate is $5.00 (versus ~$4.00) and Almond Croissant is $5.00 (versus ~$4.00). 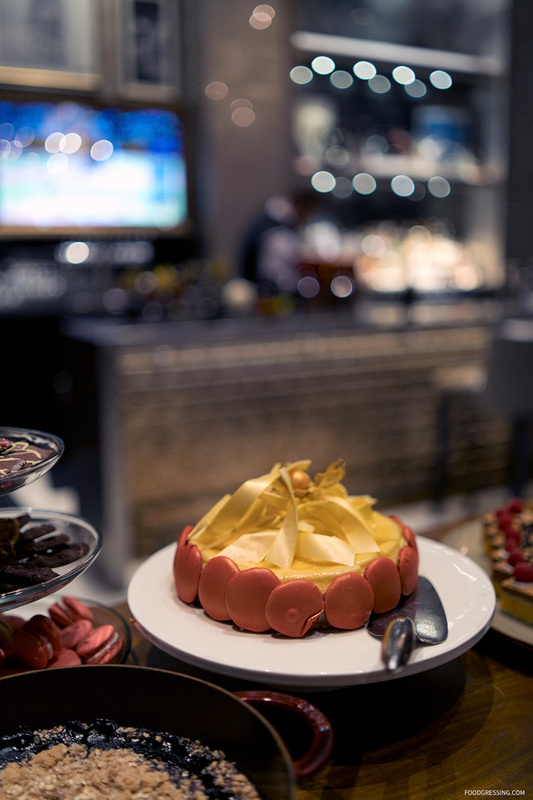 The desserts are priced at $6.50. 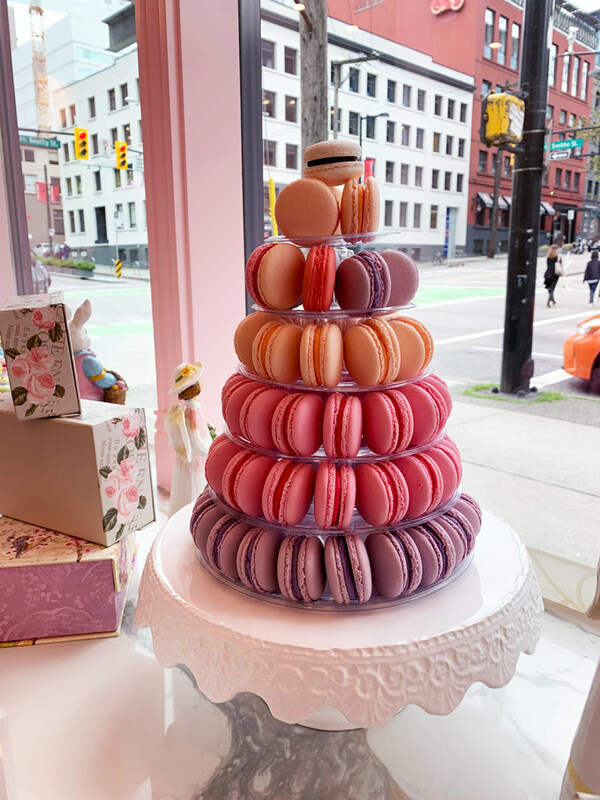 Around the shop, you’ll also notice that they sell a variety of confections like nuts, candies, and madeleines. 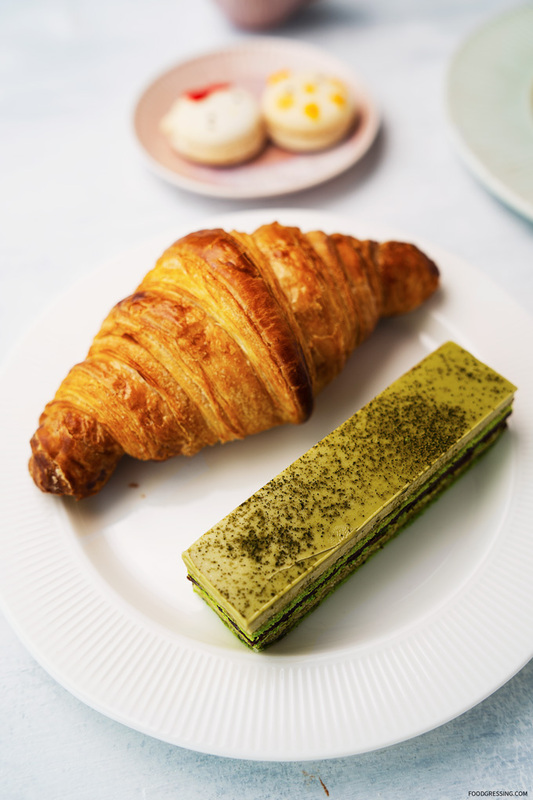 I picked up a few items to go including a regular croissant ($3.95), Lemon Meringue Tart ($6.50), Matcha Opera Cake ($6.50), Cassis Cheese Cake with BlackCurrants ($6.50) and two macarons ($3.25 each). 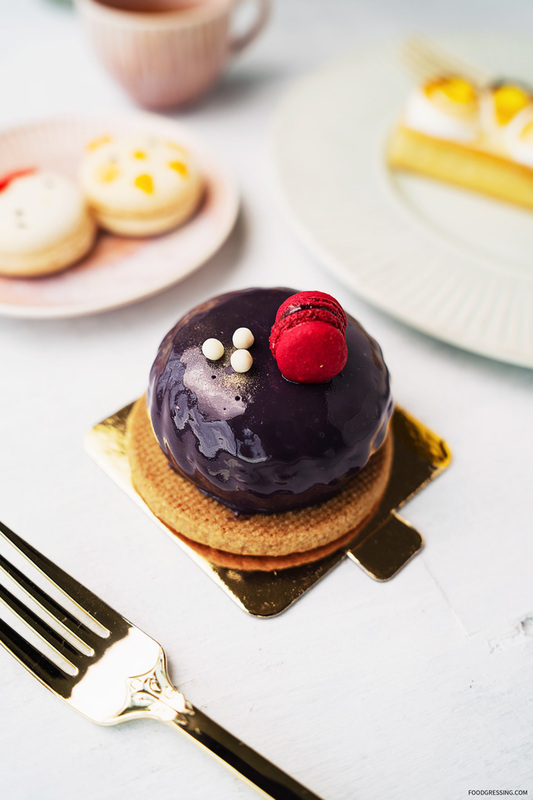 The Cassis Cheese Cake is apparently their signature dessert with a blackcurrant shell, cheesecake on the inside and a blackcurrant filling. 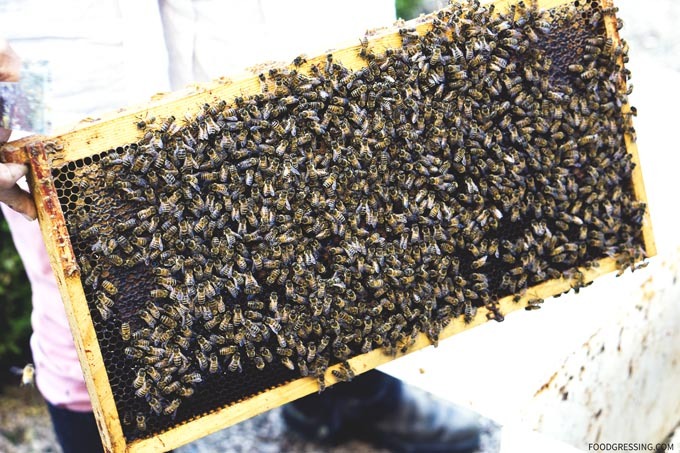 I found it to be not to sweet, very moist, and had very nice fruity notes. 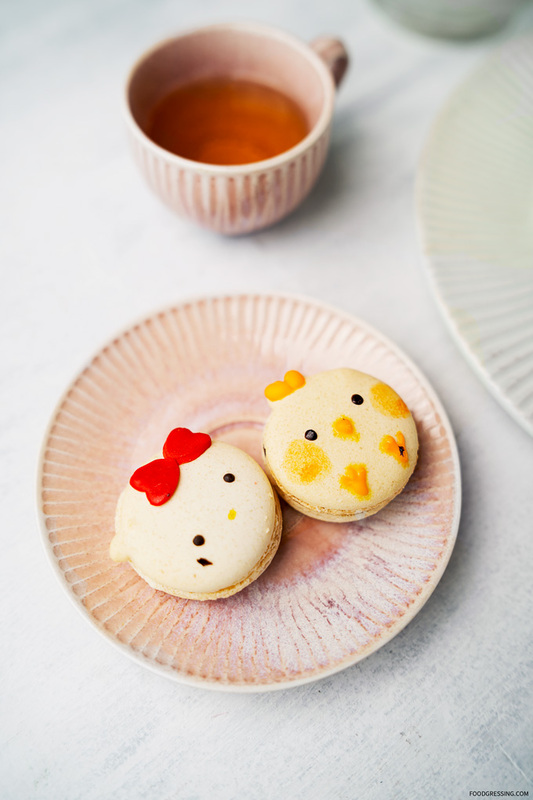 Le Cassis makes these charming Hello Kitty and Chicken macarons. 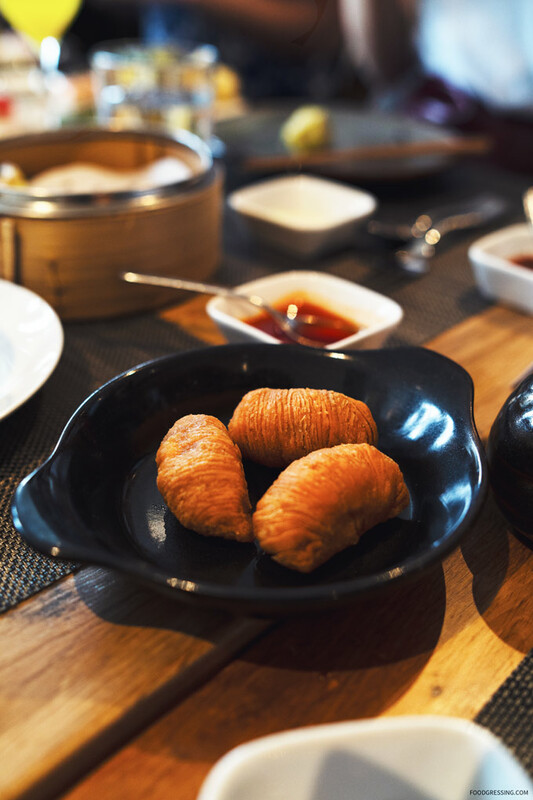 They had a nice, thin egg-shell like crust and a smooth, light but not sticky filling. The regular croissant was a little denser and not as light and fluffy as I would like but still OK. 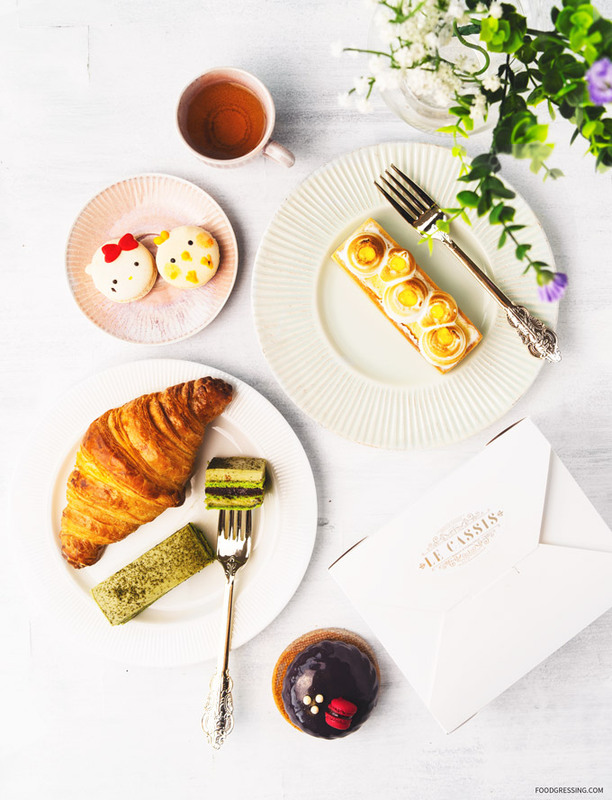 I personally would still drive to L’Atelier Patisserie on Main and East 5th for their croissants. 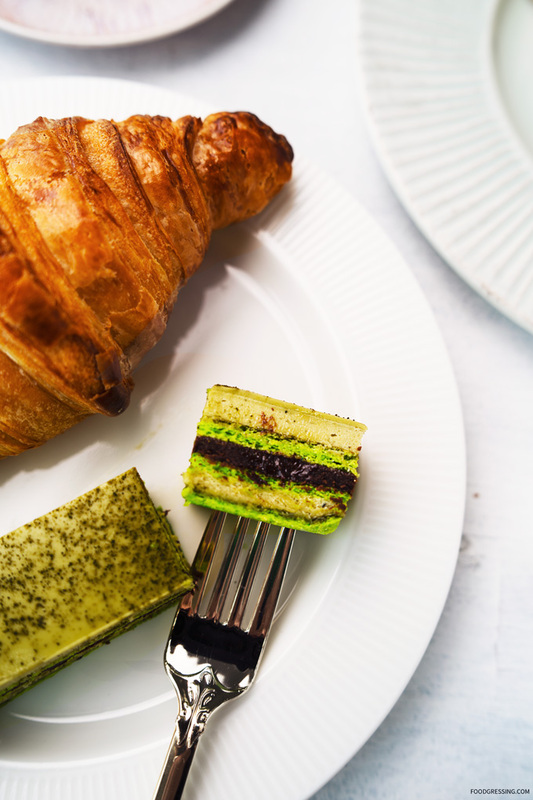 The Matcha Opera Cake was pretty good with alternating layers of chocolate, buttercream, matcha and almond sponge. I did find a bit on the sweeter side and would have liked to have more of a stronger, bitter matcha taste to balance it a bit more. 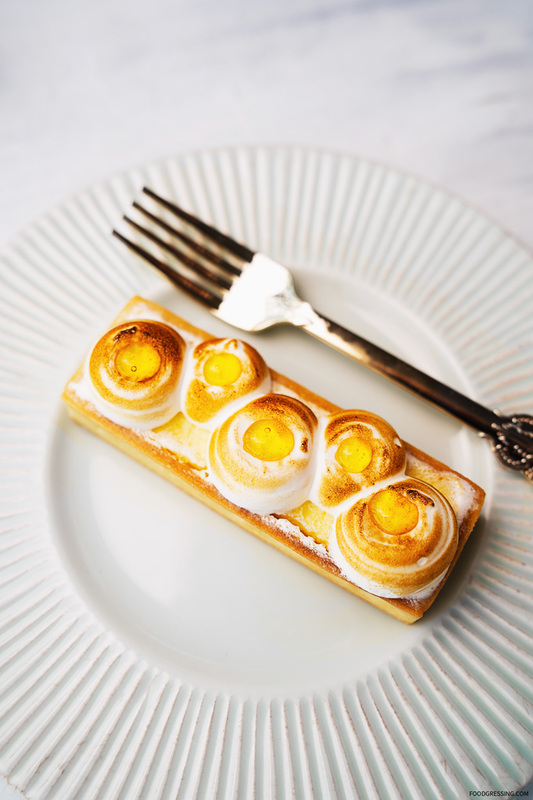 The Lemon Meringue Tart was quite good as well and had a nice buttery crust and zesty lemon filling. 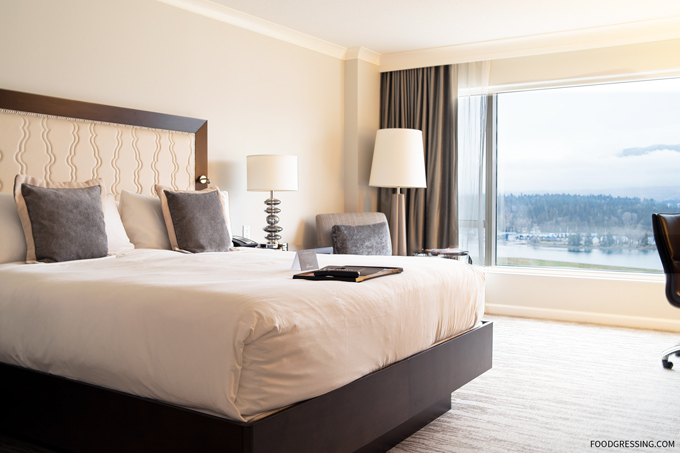 If you’re looking for an upscale, luxurious accommodation in Vancouver within the Downtown Core and that offers unparalleled West Coast views, the Fairmont Waterfront Hotel is just be the place. 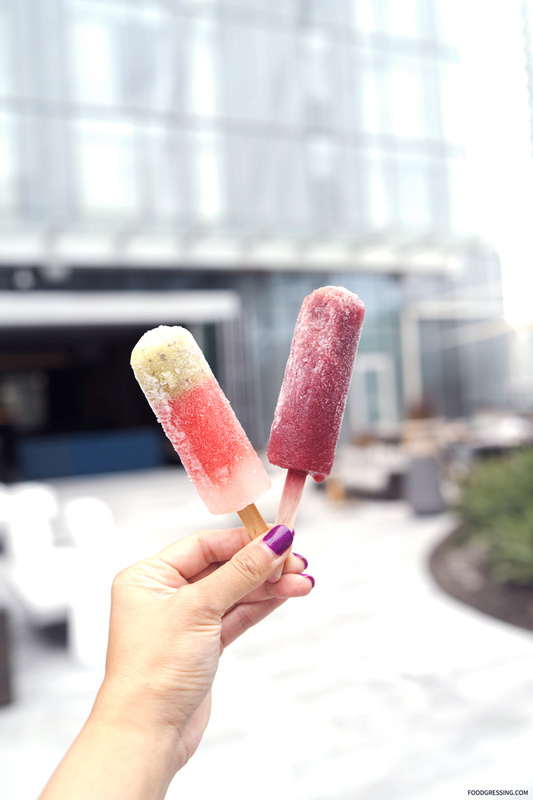 Located in Vancouver’s vibrant harbourfront area, the Fairmont Waterfront is a world-class luxury hotel that offers easy access to everything for an unforgettable visit to Vancouver. 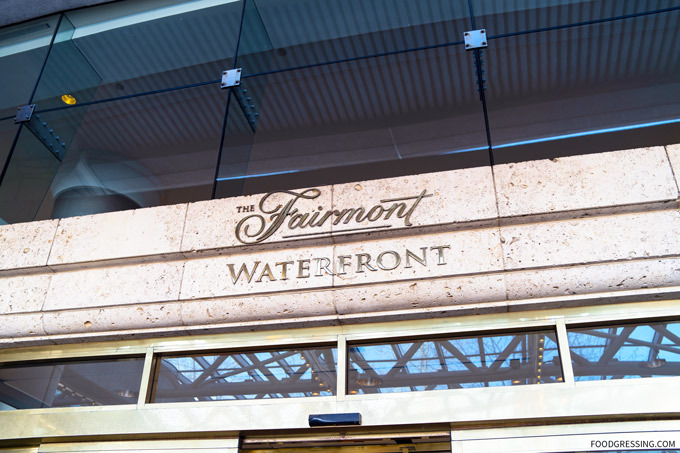 I recently enjoyed a hosted overnight stay at the Fairmont Waterfront. Here’s a look at what you can expect. 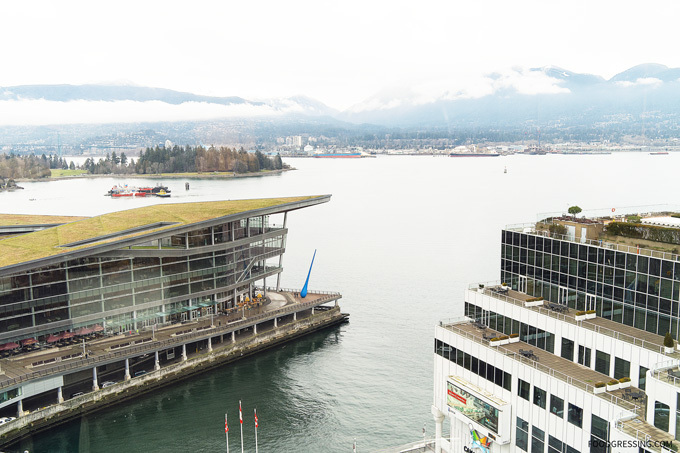 To start, I had the pleasure of staying in the hotel’s Harbour View Suite which offers stunning views of the Vancouver harbour, North Shore Mountains and Stanley Park. 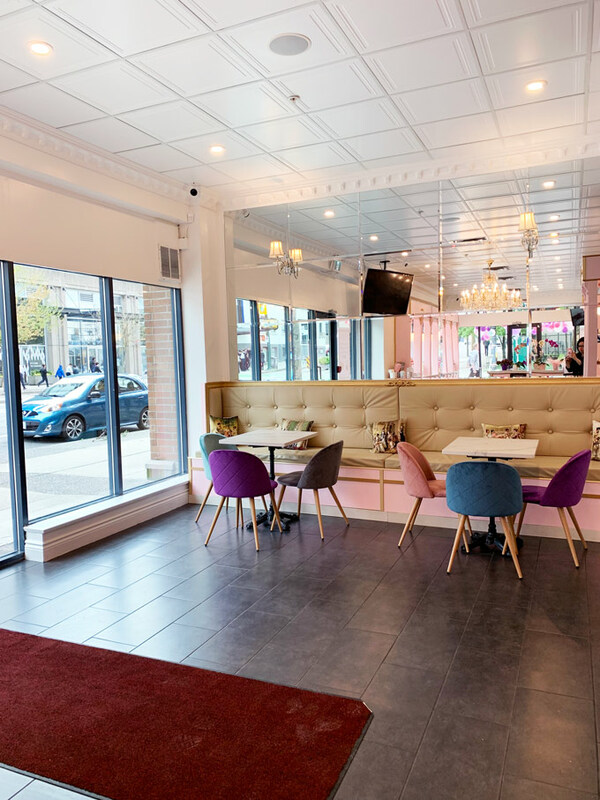 I really liked the room’s inviting design featuring floor-to-ceiling windows and a colour palette of neutral creams, golden caramels and warm browns. 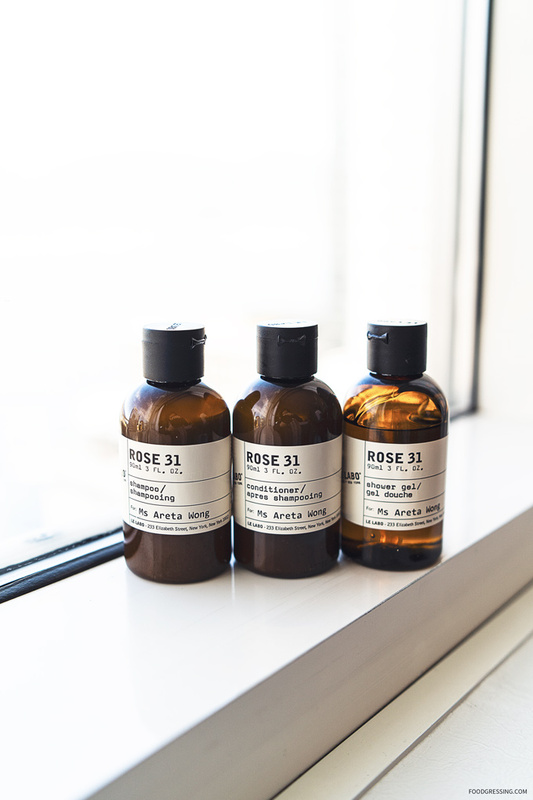 The Fairmont is known for their personalized service and that even translates to personalized bathroom amenities. It was very nice of them to print my name on the shampoo, conditioner and shower gel bottles. 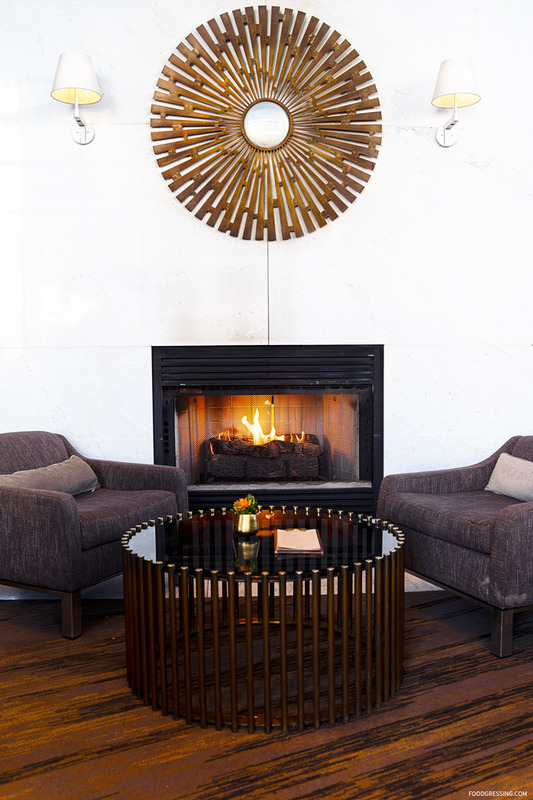 The Fairmont Waterfront’s Health Club is a great place to unwind or energize yourself. Some of the features of the health club include an outdoor 50 ft heated pool, indoor whirpool, steam rooms, fitness centre and so forth. 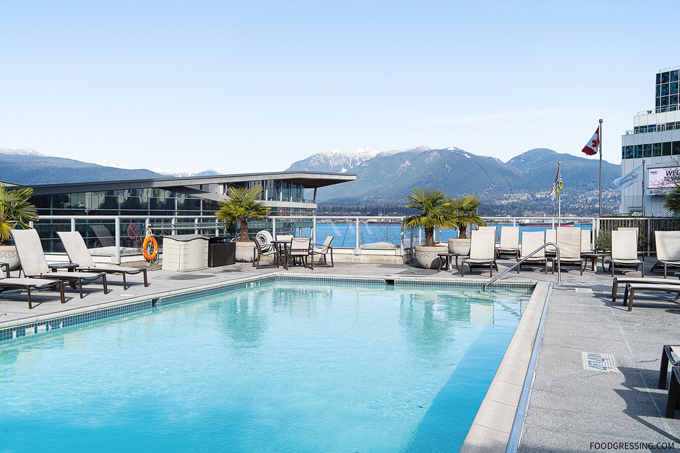 The outdoor heated pool has such impressive views overlooking Stanley Park and the North Shore Mountains. 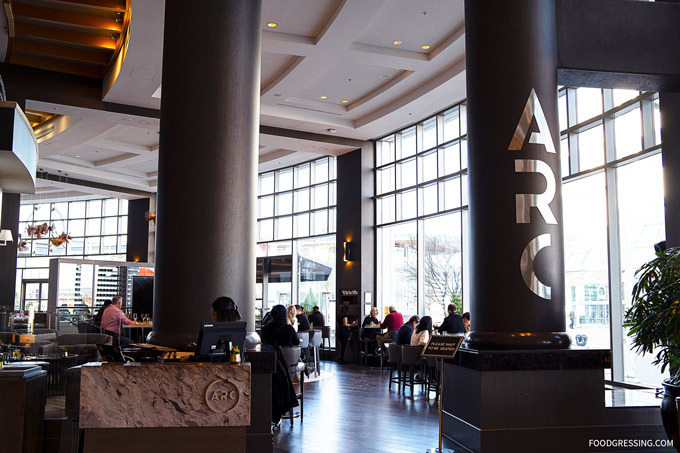 ARC Restaurant is the hotel’s onsite restaurant led by Executive Chef Anthony Marzo. 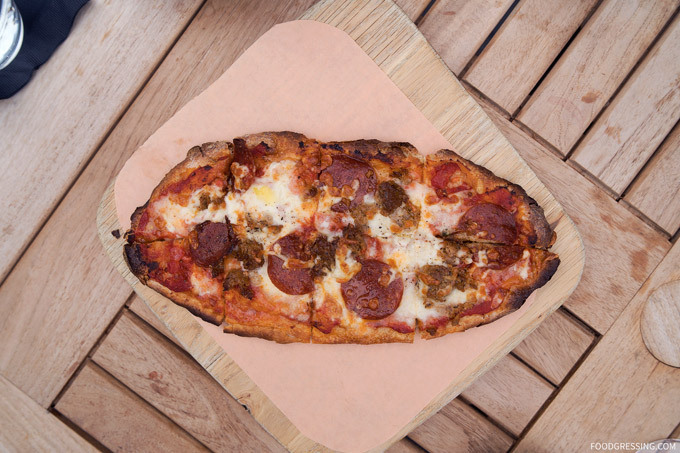 ARC is known for offering urban artisanal cuisine using fresh, locally sourced ingredients. 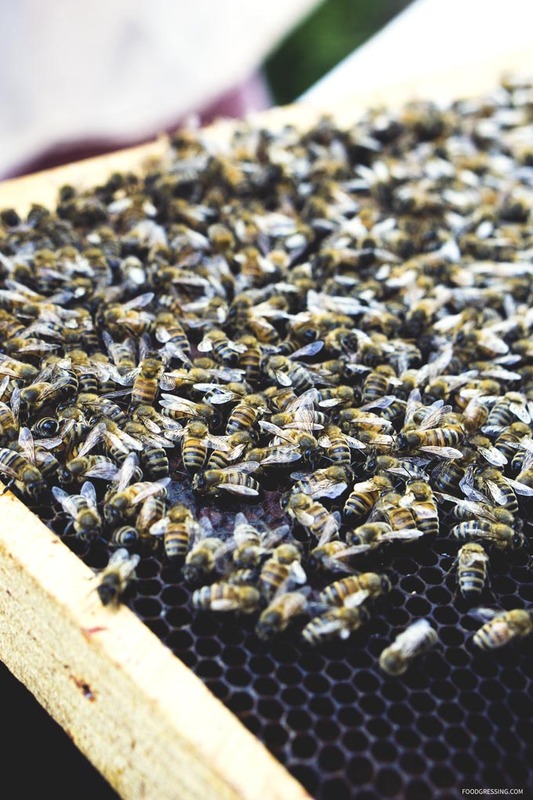 Some of the ingredients incorporated into the dishes come from the hotel’s very own rooftop herb garden and beehives. 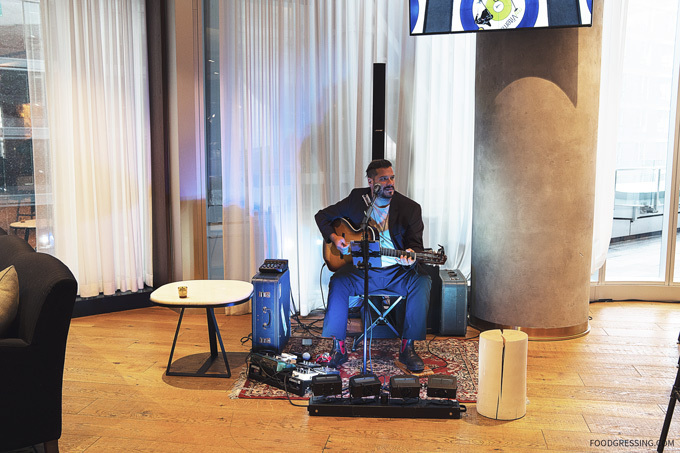 The ARC Bar can help quench your thirst and unwind with cool cocktails, a selection of craft beers, and live music nightly. 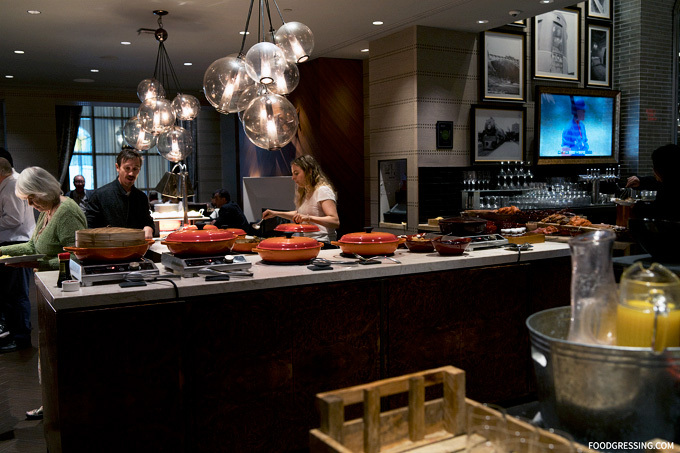 For dinner, ARC offers simply inspired, handcrafted fare in a relaxed setting. 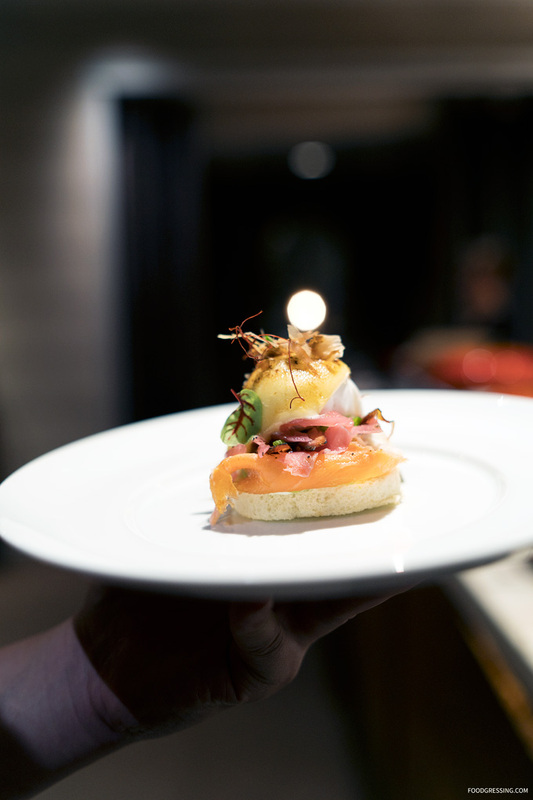 They also have special offers like the 3-course Indigenous-inspired Talking Trees Menu available until the end of May. 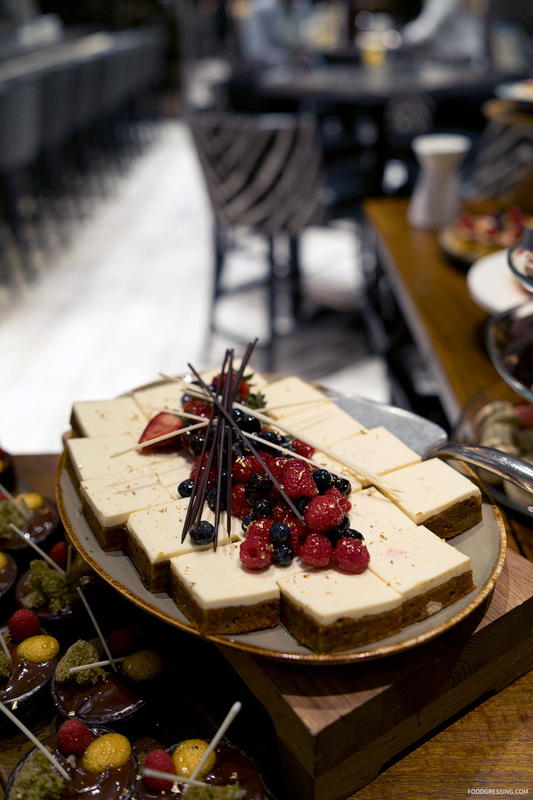 Brunch at ARC takes place 11:30 am to 14:30 pm on Saturday and Sundays. 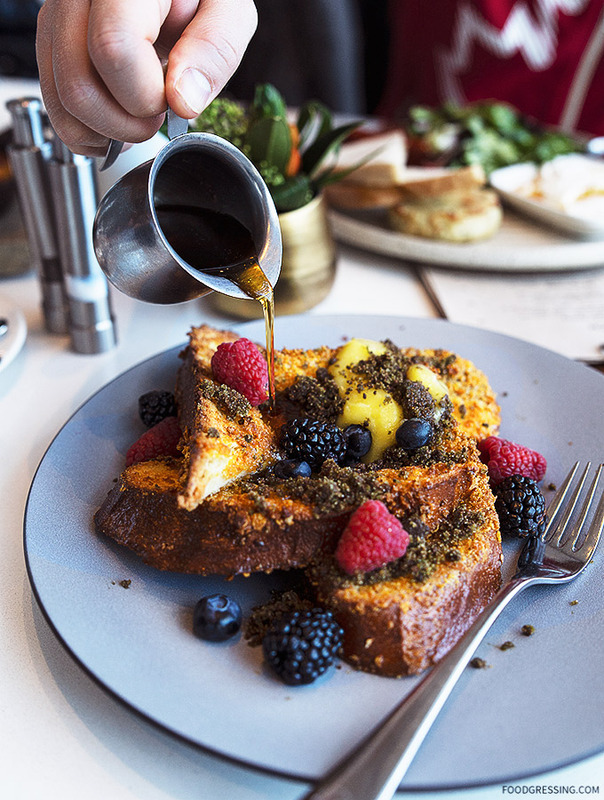 ARC’s simple and focused brunch menu features Breakfast Nachos, Wild Mushroom Roesti, Lamb Shakshuka, Longshoreman’s Breakfast, Croissant Sandwich, and Corn Crusted French Toast. 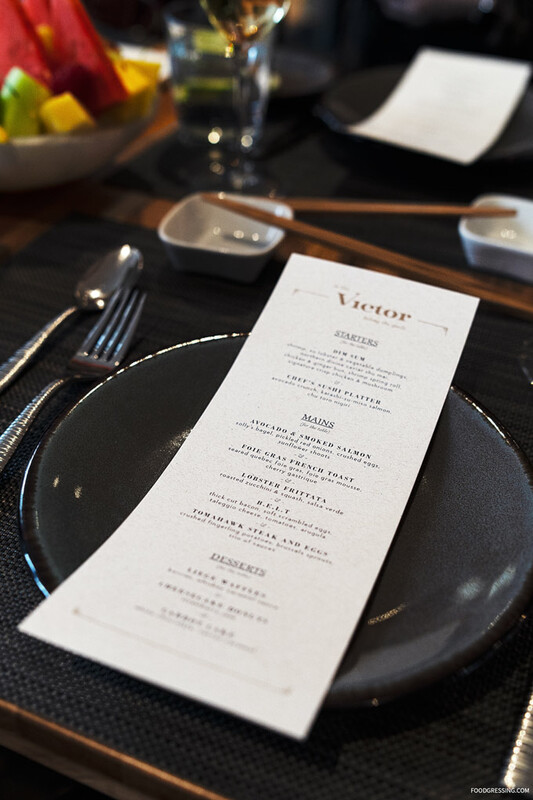 While The Victor at Parq Vancouver is known for their Pacific-Northwest-focused cuisine featuring contemporary and classic seafood and steak, they also serve brunch from 10:30am – 2:30pm every Sunday. 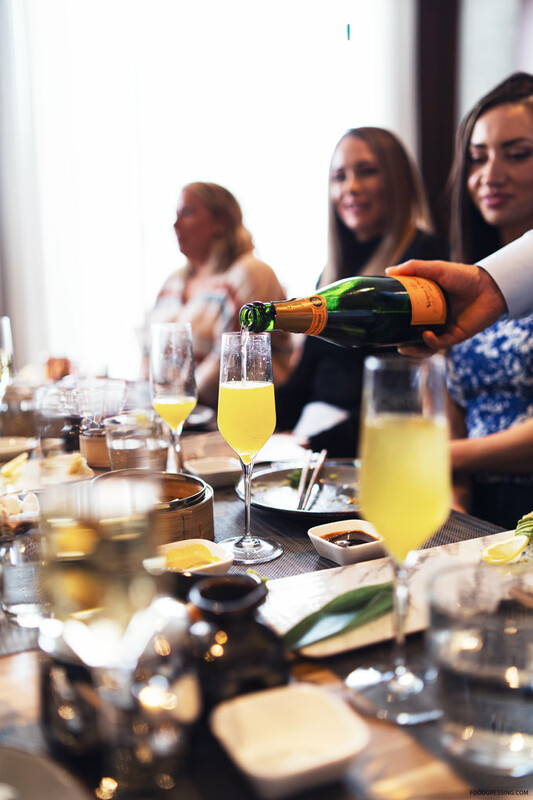 Sunday brunch highlights include Lobster Frittata; Oscar Egg Benedict; Steak & Eggs; Foie Gras French Toast; Wagyu Breakfast Burger; Dim Sum and more. 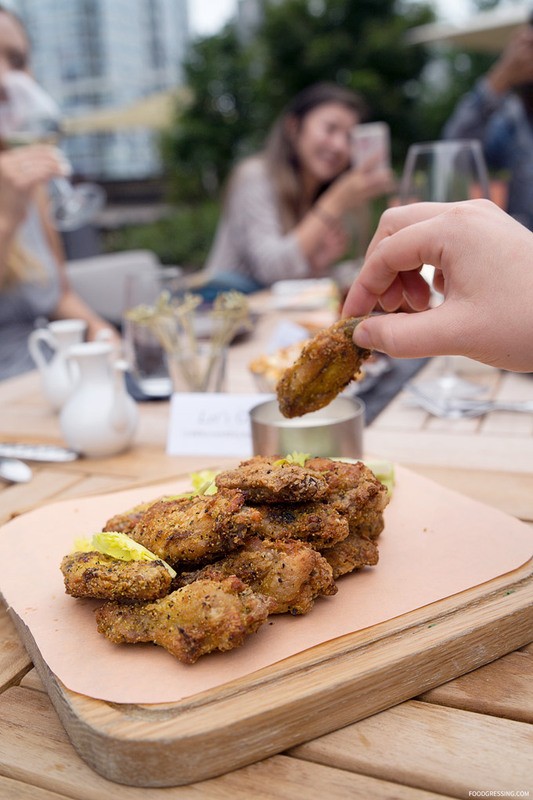 I was recently invited to a media tasting of the Sunday brunch menu. Here’s a look at what you can expect. 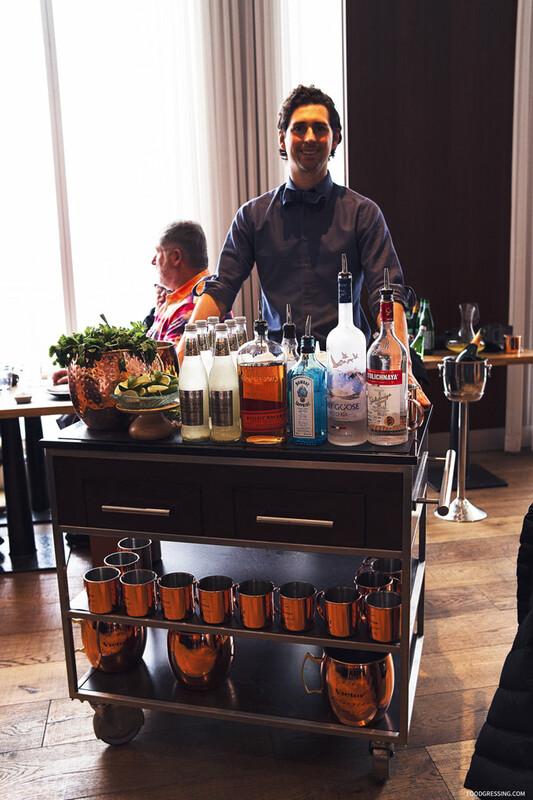 Start your brunch off with bubbles, mimosas, an espresso-based drink or build your your own Caesars and Marys at the table side mule cart. 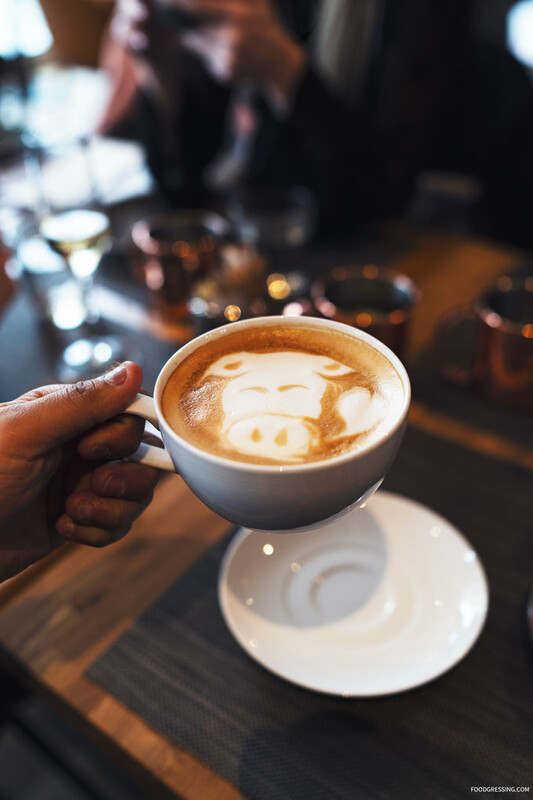 One of the media attendees received some beautiful latte art in honour of the Year of the Pig for Lunar New Year. 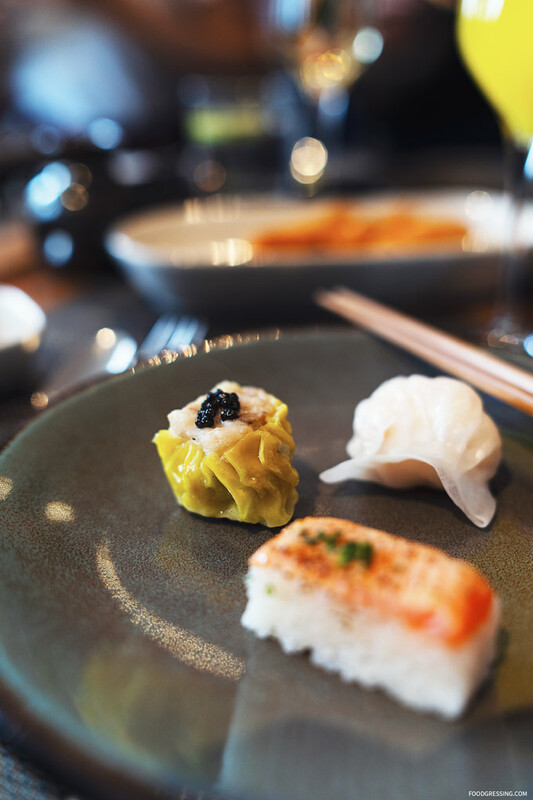 To start, we had an assortment of dim sum including Shrimp, XO Lobster and Vegetable Dumplings; Northern Divine Caviar Shu Mai; Chicken & Ginger Bun; Shrimp Spring Roll; and the Victor’s signature Crispy Chicken & Mushroom. 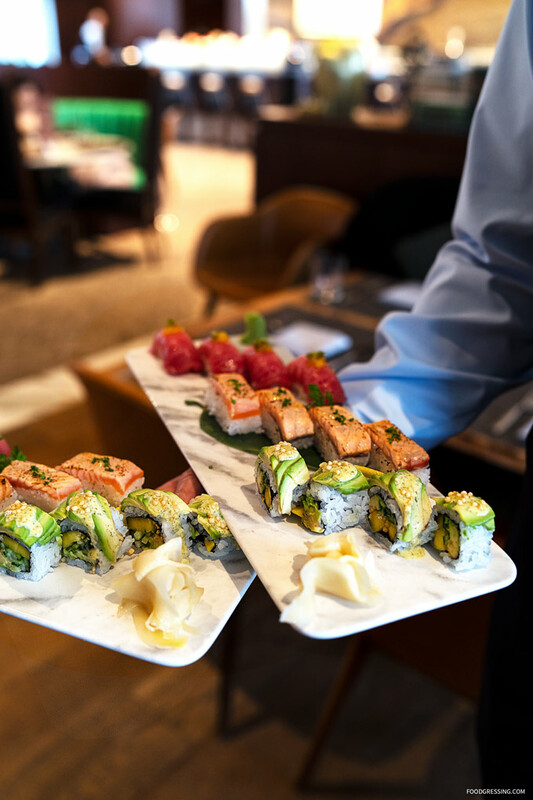 The Chef’s Sushi Platter featured Avocado Crunch (avocado, cucumber, mango, shiso aioli, puffed rice); Karashi-Su-Miso-Salmon; and Chu Toro Tuna. 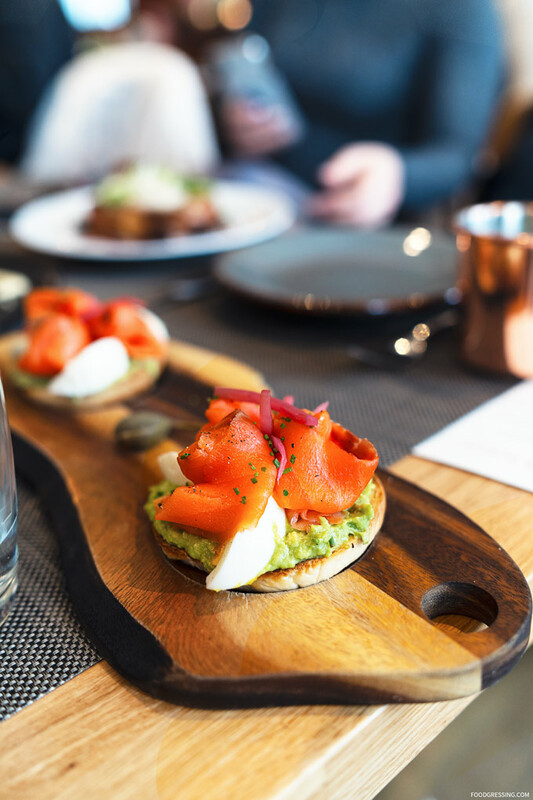 Solly’s bagel was topped with avocado, smoked salmon, pickled red onions, crushed eggs, and sunflower shoots. 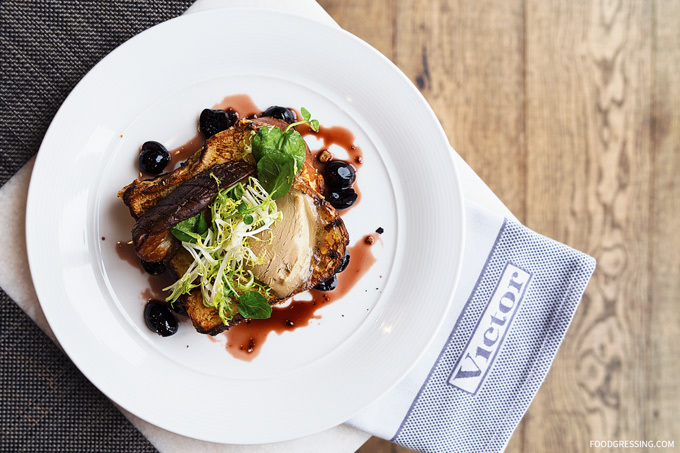 One of the more unique mains we enjoyed was the Foie Gras French Toast with seared Quebec foie gras, foie gras mousse, and cherry gastrique. 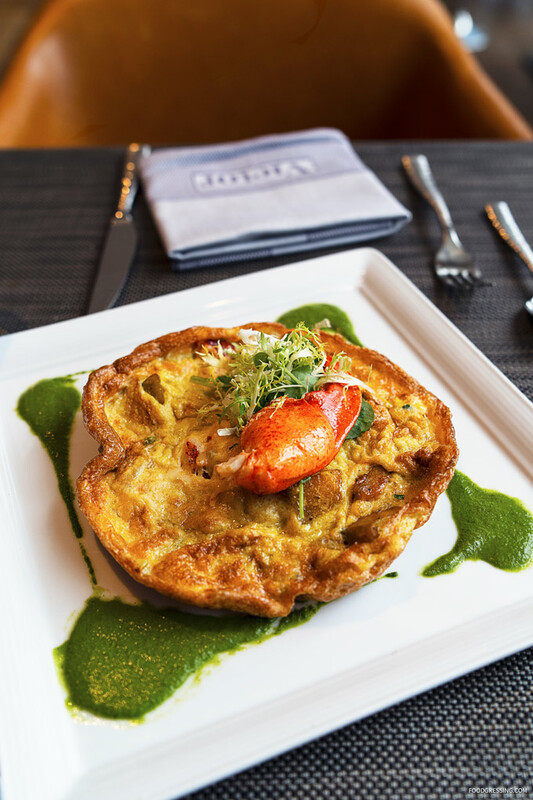 For an elevated frittata option, there was the Lobster Frittata with roasted zucchini and squash as well as salsa verde. If you really love your bacon, the B.E.L.T. is a good option. 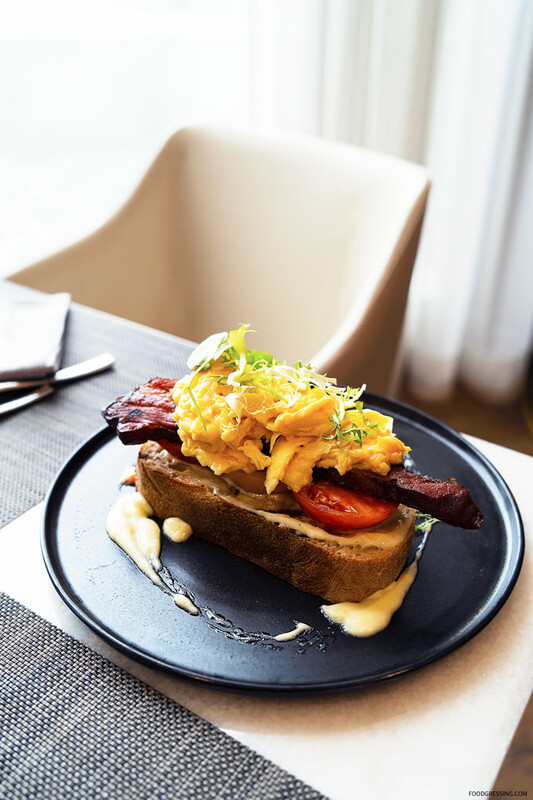 The bacon was very thick and the dish also came with soft scrambled eggs, taleggio cheese, tomatoes, and arugula. 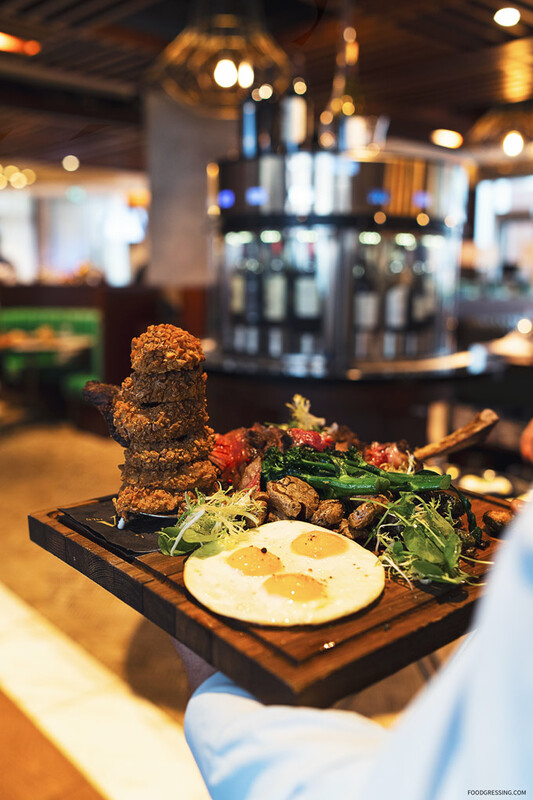 To take your brunch to the next level, you can order a Tomahawk steak to share with the table. Accompanied with crushed fingerling potatoes, onion rings, brussels sprouts, and a trio of sauces. 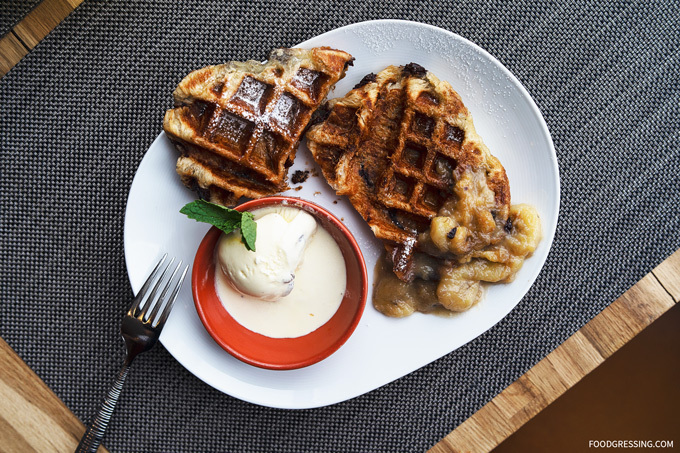 For a sweet finish, the Victor has a variety of brunch desserts including Liege Waffles; Cheesecake Donuts with Strawberry Jam; and Carrot Cake. 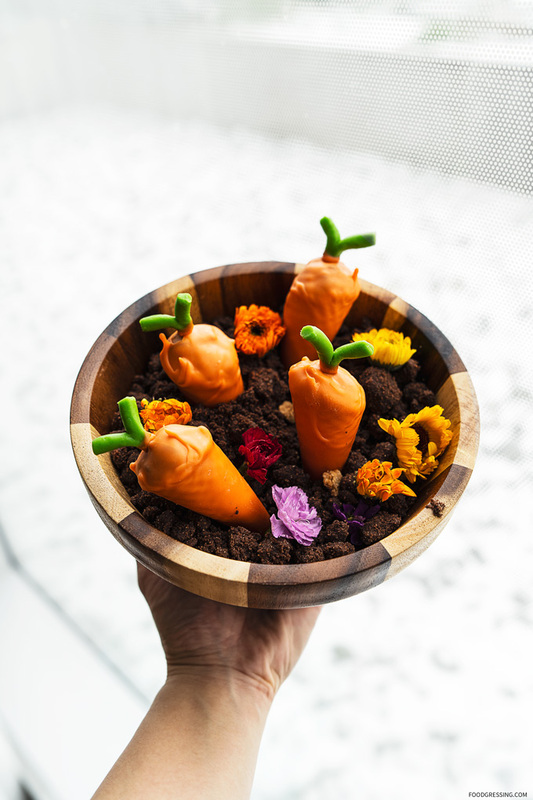 The most adorable dessert feature was the “planted carrots” which were carrot cakes with white chocolate coating. There was also live music playing during Sunday Brunch at the Victor. 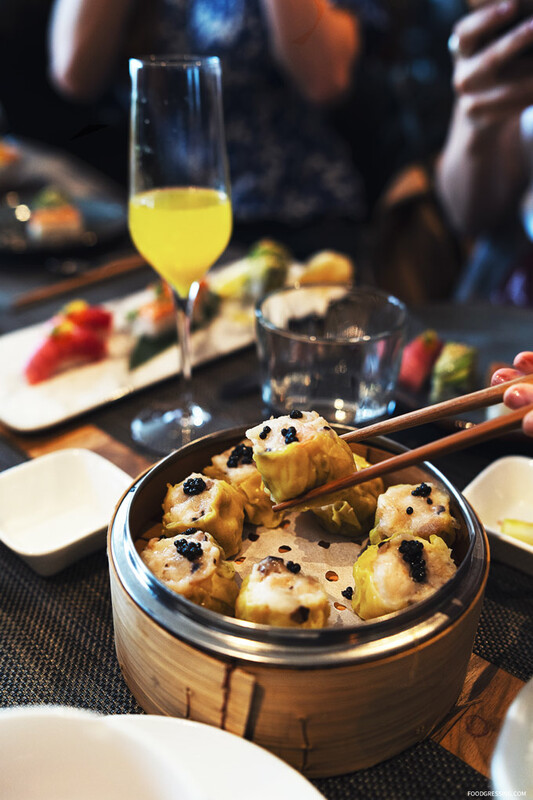 My favourite starter, main and dessert were the Northern Divine Caviar Shu Mai, Lobster Frittata, and Cheesecake Donuts. 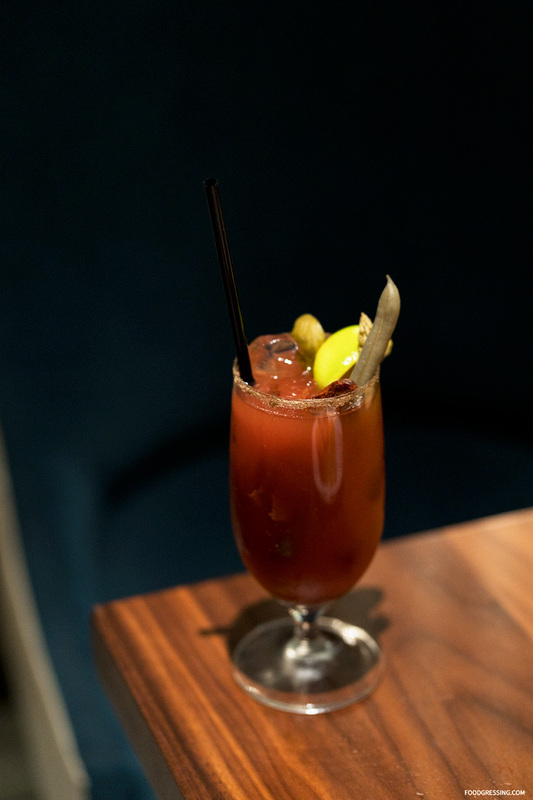 For some extra brunch indulgement, I would recommend the Tomahawk for the Table. 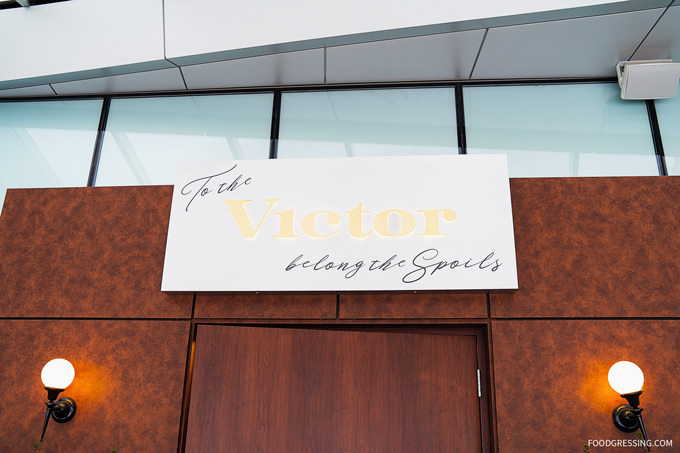 For more information on Sunday brunch at The Victor, visit here. 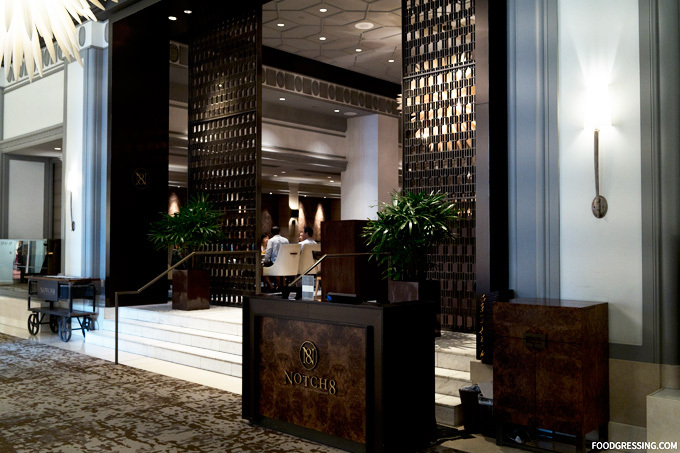 A few months ago, I attended a wedding held at the Four Seasons Hotel in Vancouver. 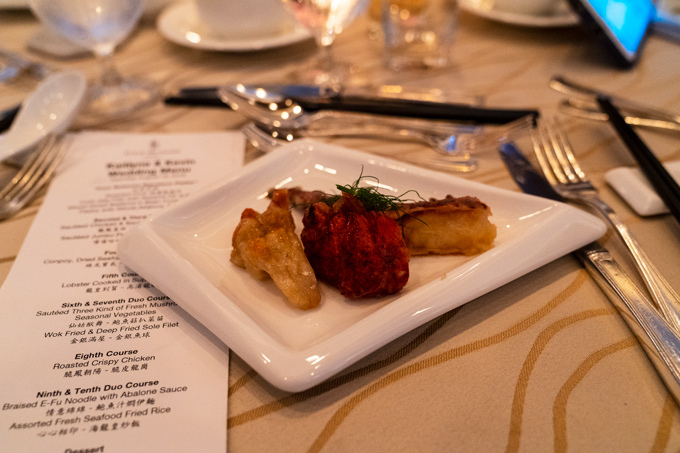 The dinner reception featured a 10-course Chinese banquet. 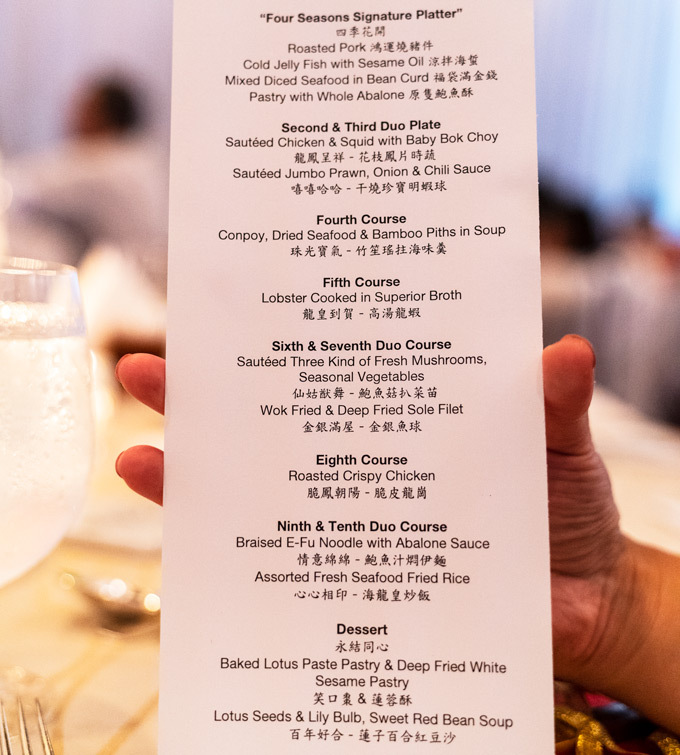 While a wedding at the Four Seasons is certainly grandiose, I thought the dinner was quite lackluster and fel short of my expectations. 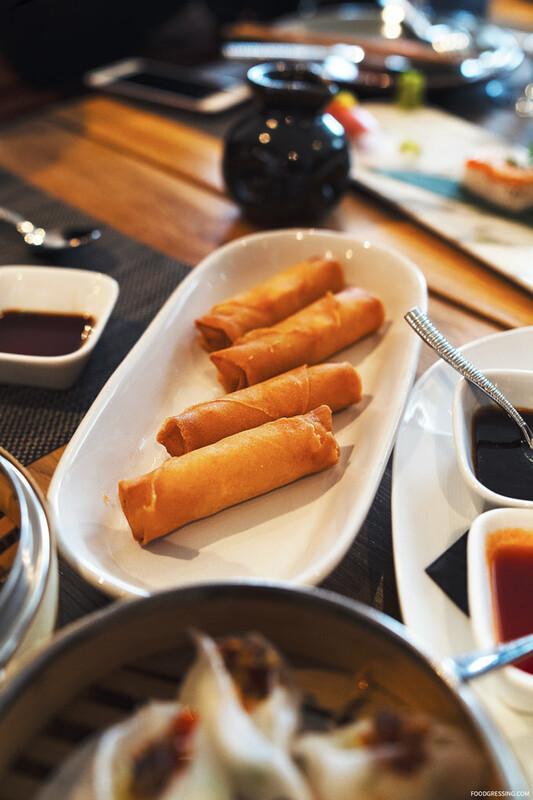 According to this article from 2012, the Four Seasons Vancouver has a dedicated Chinese kitchen. 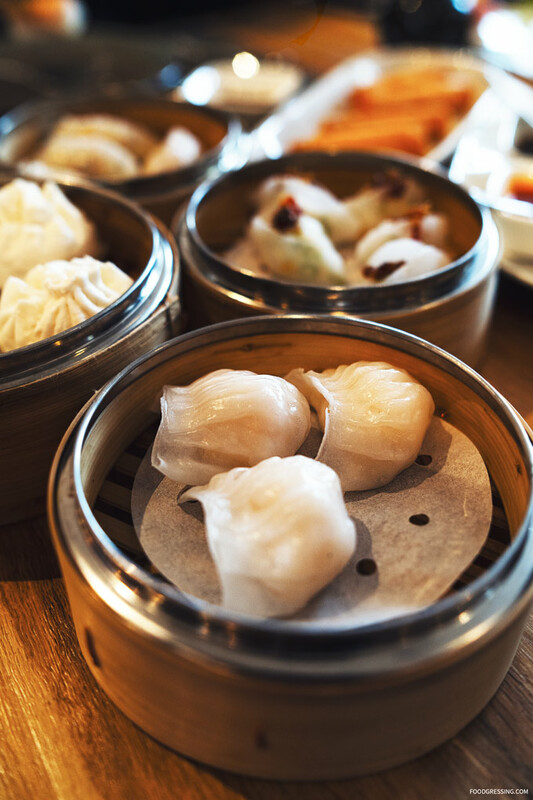 The food is prepared in partnership with Grand Dynasty restaurant in Burnaby. 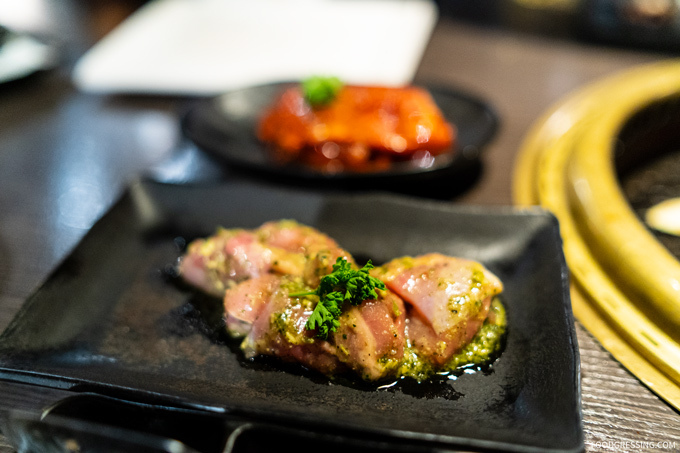 To start, the dishes tasted really bland and needed salt and seasoning. I don’t know if this was requested by the hosting families as low salt is favoured for the health of elders. 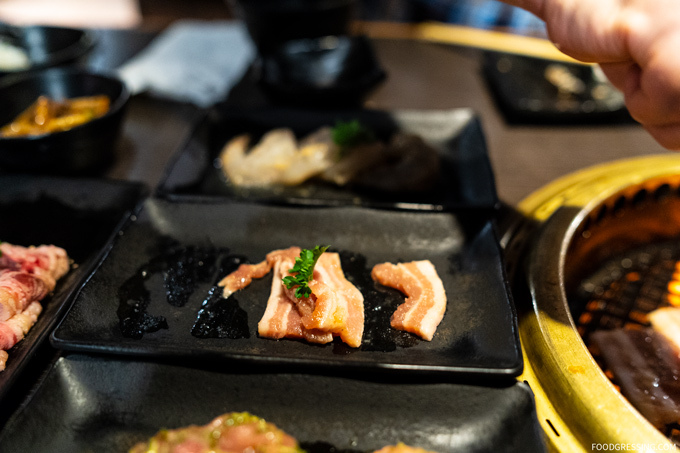 The presentation of the dishes certainly lacked oohs and ahhs. 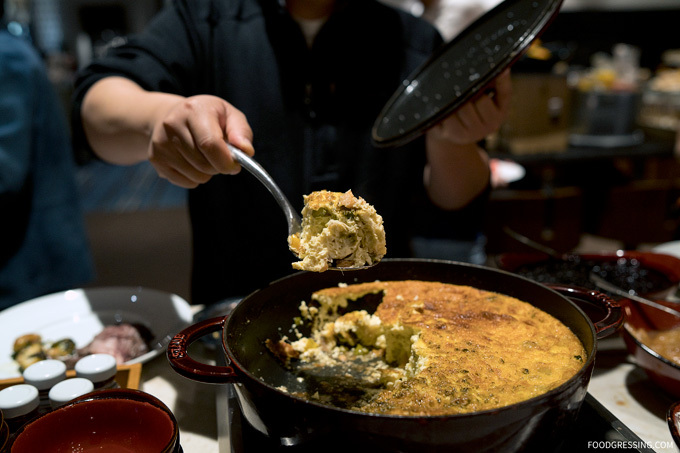 The dishes came in individual portions and were served in more of a Western-style. 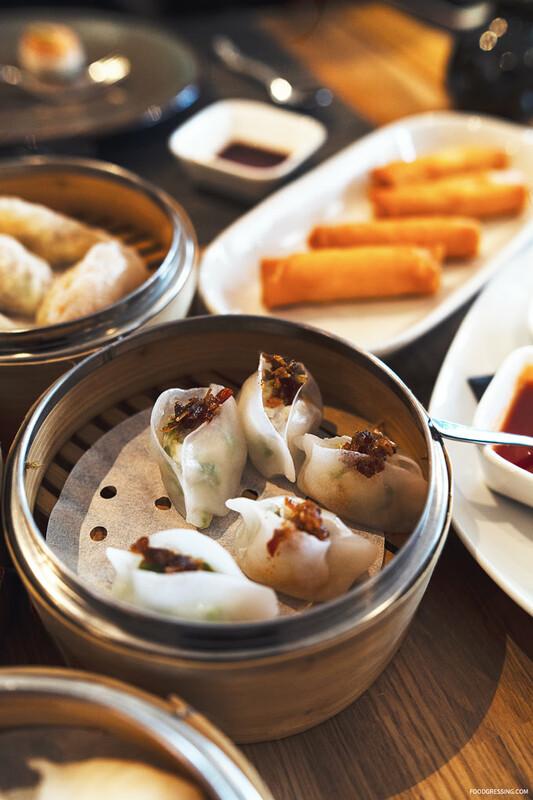 In a traditional Chinese banquet, the dishes as a whole are presented to the table first and then subsequently divided. Perhaps this is not as logistically feasible in a hotel setting. 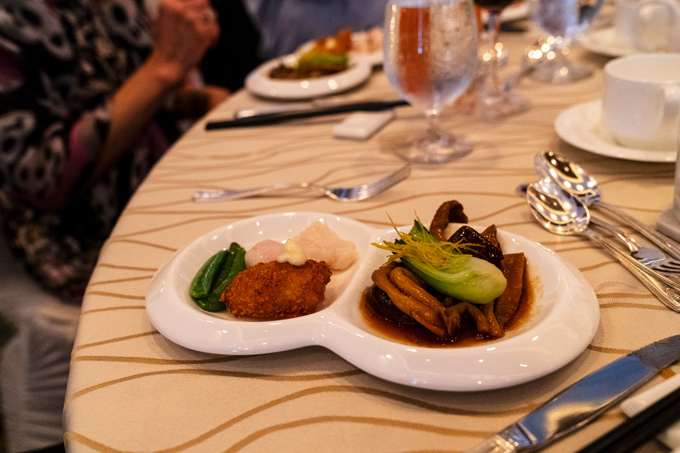 I also thought the compartmentalized dinner plates looked a bit odd. 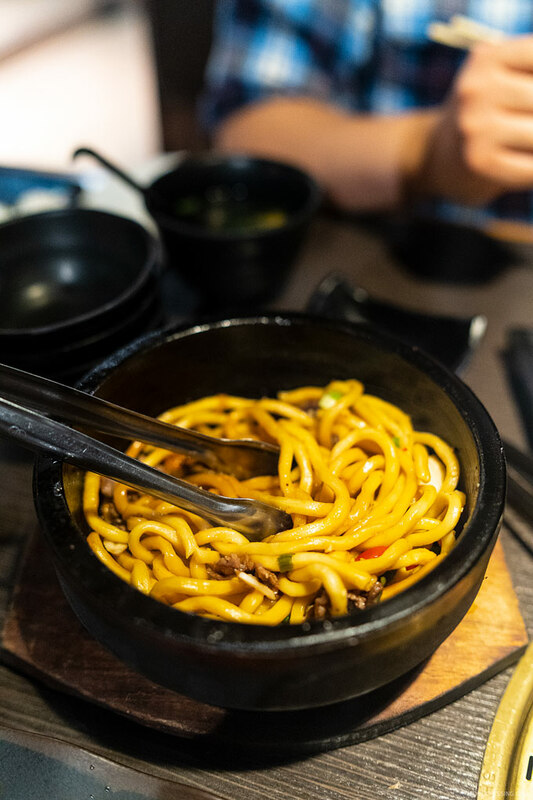 It made some of the dishes looked rather sad especially the rice and noodles. They sort of looked like food served for toddlers on a kid’s plate. 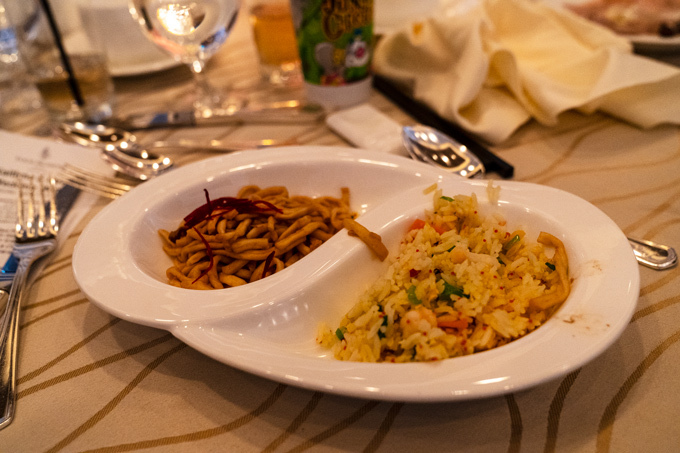 One of the dishes that was simple yet poorly executed was actually the fried rice! It had a burnt taste to it. I had others taste it and they also concurred. However, it just seemed that my dish was one of the isolated cases. Service was terrific as the pace of the dinner was good and servers were friendly. It was unfortunate that the food was only about average considering the price tag. 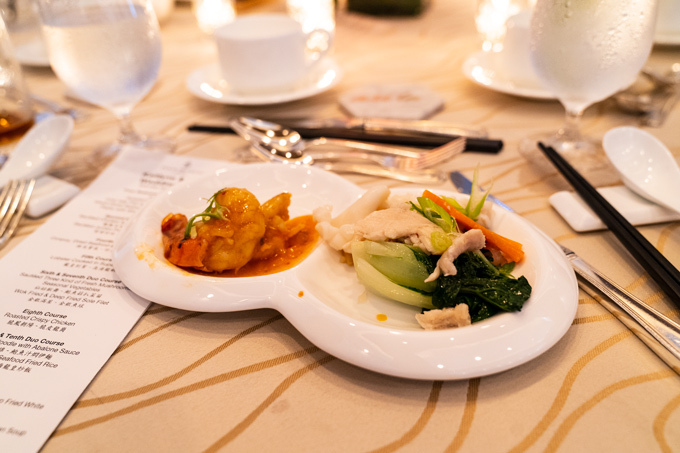 My sense is that the Western-style plated dinners or buffet might fare better than the Chinese banquet. It was a good effort but the food and its presentation could be improved in my opinion. 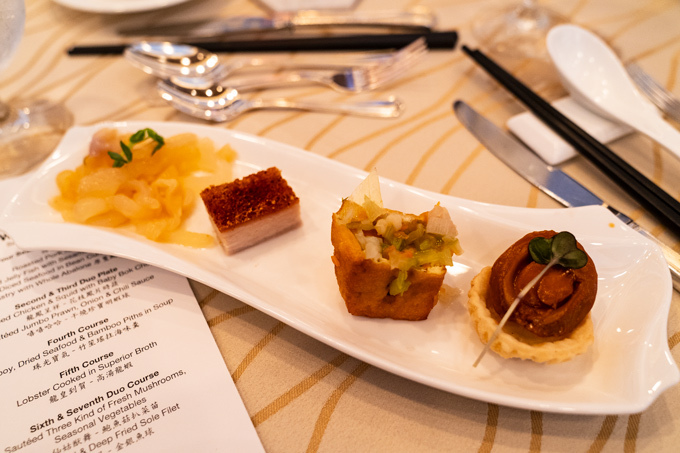 The platter featured roasted pork, cold jelly fish with sesame oil, mixed diced seafood in bean curd, and pastry with whole abalone. 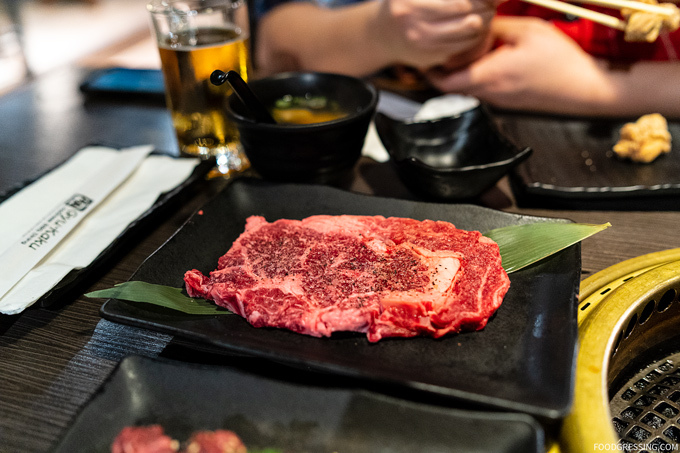 Gyu-Kaku Japanese BBQ has been my go-to place for a Japanese Yakiniku dining experience where you grill bite-size meat and vegetables over a flaming charcoal grill. 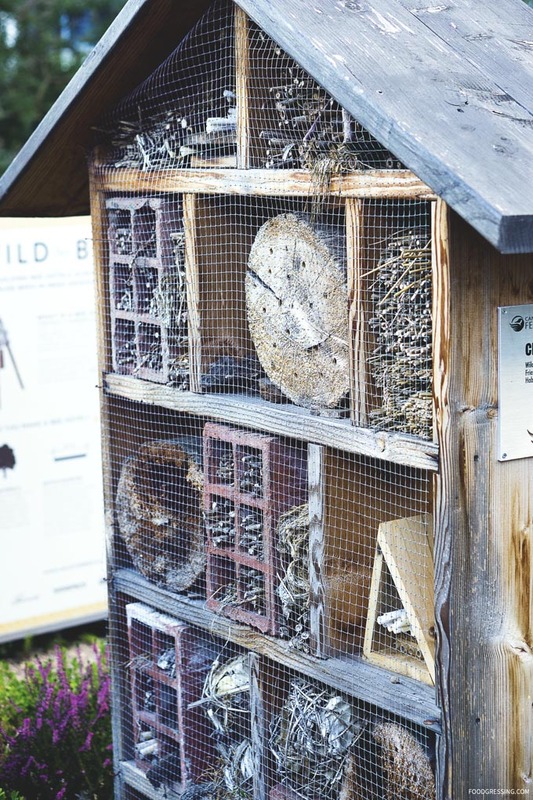 In Vancouver, they have three locations (Downtown, West Brodaway and Richmond) but they actually have over 700 world wide including Japan, US, Hong Kong, Indonesia etc. 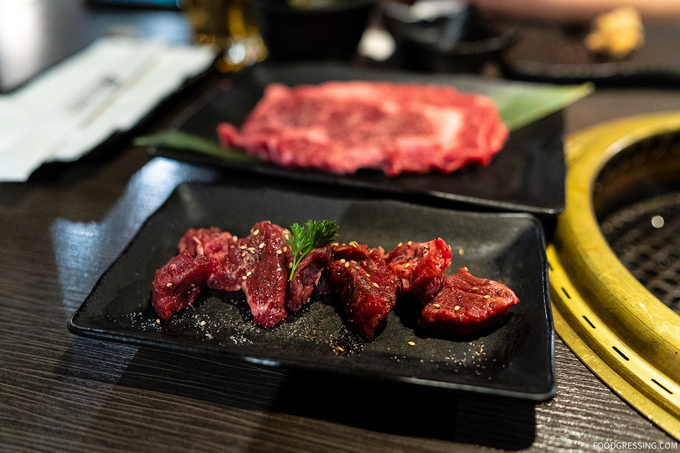 I had some friends in town from Europe this holiday season and we decided to go to Gyu-Kaku on Boxing Day. While the restaurant does take reservations over OpenTable, all the spots were taken and we decided to just do a walk-in and wait in line. 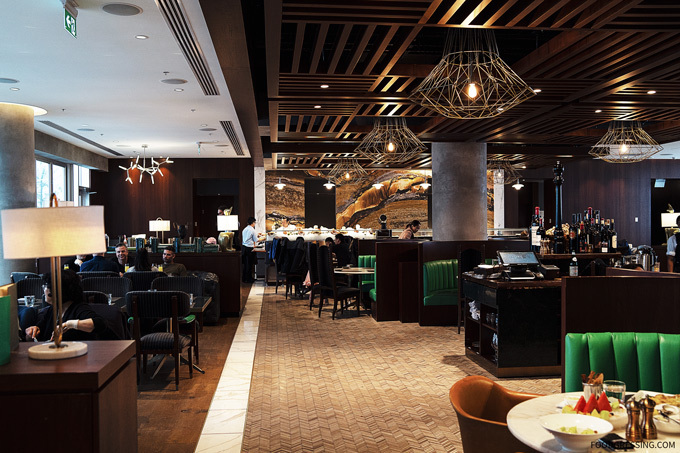 The location in Downtown Vancouver is nicely spacious but the lighting is generally quite dim. I like the West Broadway location which has more natural lighting. We waited for 40 minutes and it was Happy Hour by the time we got a booth. 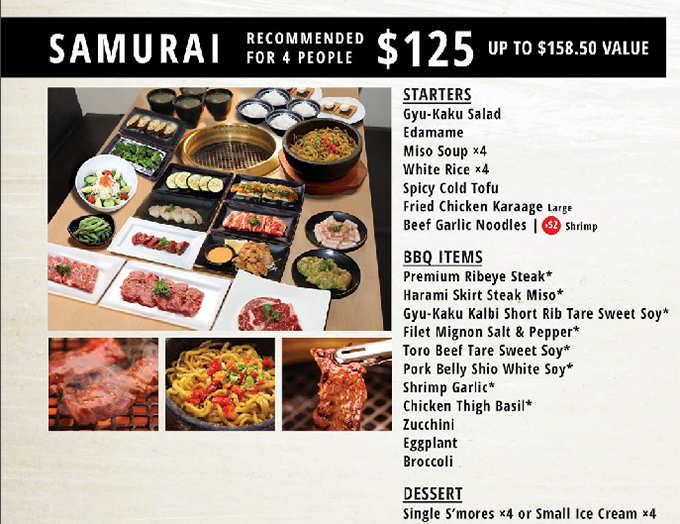 All combos are 20% off during Happy Hour and we went with the Samurai combo for 4 people. 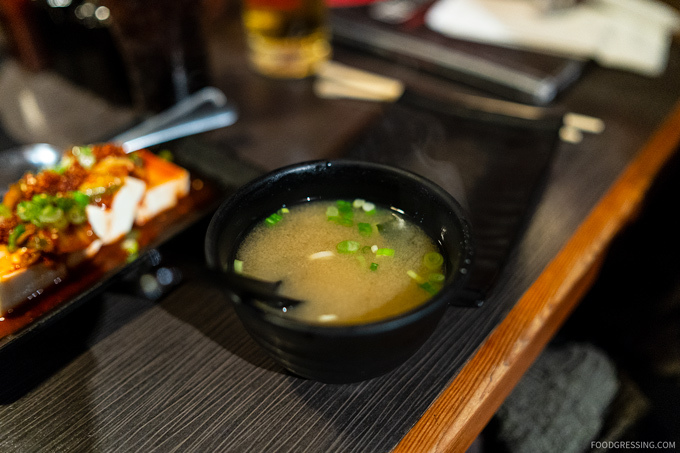 The starters included Gyu-Kaku Salad, Edamame, Miso Soup, White Rice, Spicy Cold Tofu, Fried Chicken Karaage, and Beef Garlic Noodles. 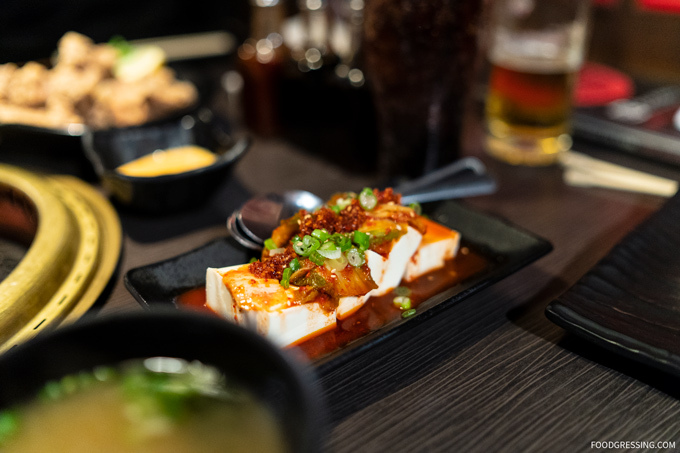 One favourite was the Spicy Cold Tofu featuring soft tofu topped with kimchi and spicy, crunchy garlic sauce. The flavour was very good and had a nice spicy kick. 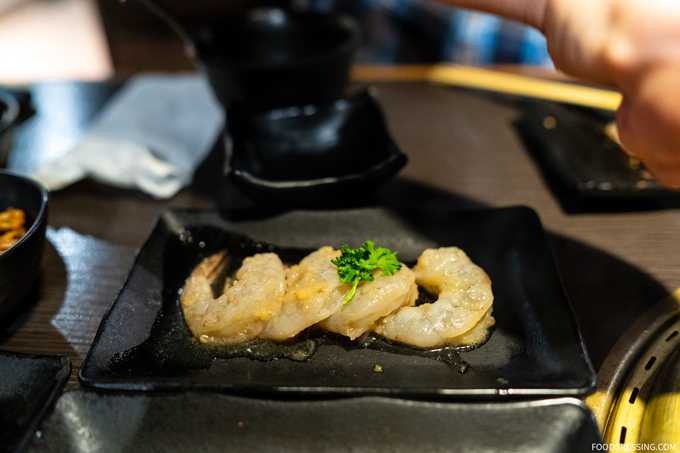 The garlic chips added texture to the dish. 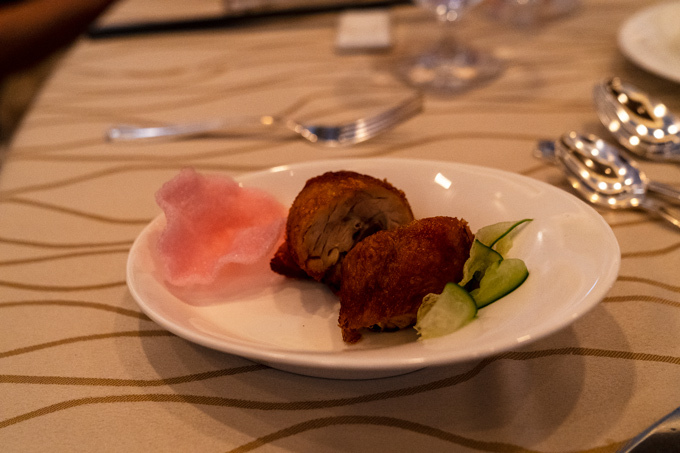 The Fried Chicken Karaage was also very good being crispy on the outside and tender on the inside. All the other starters were reasonable. 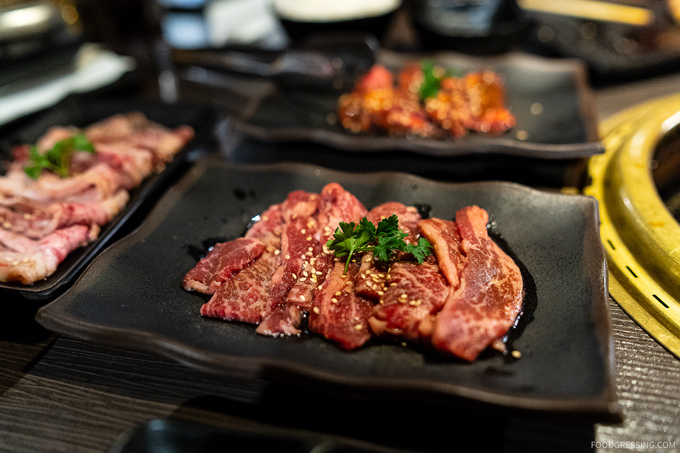 BBQ items included Premium Ribeye Steak, Harami Skirt Steak (Miso), Gyu-Kaku Kalbi Short Rib (Sweet Soy), Filet Mignon (Salt & Pepper), Toro Beef (Sweet Soy), Pork Belly (Shio White Soy), Shrimp (Garlic), Chicken Thigh (Basil), Zucchini, Eggplant and Broccoli. 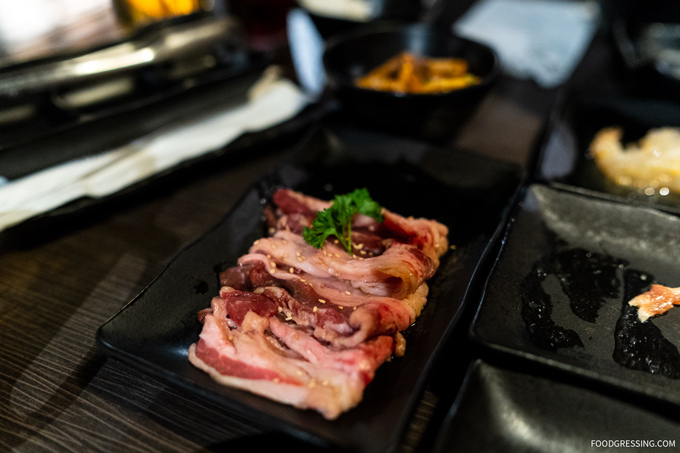 The portions, quality and seasoning of the BBQ items were good. 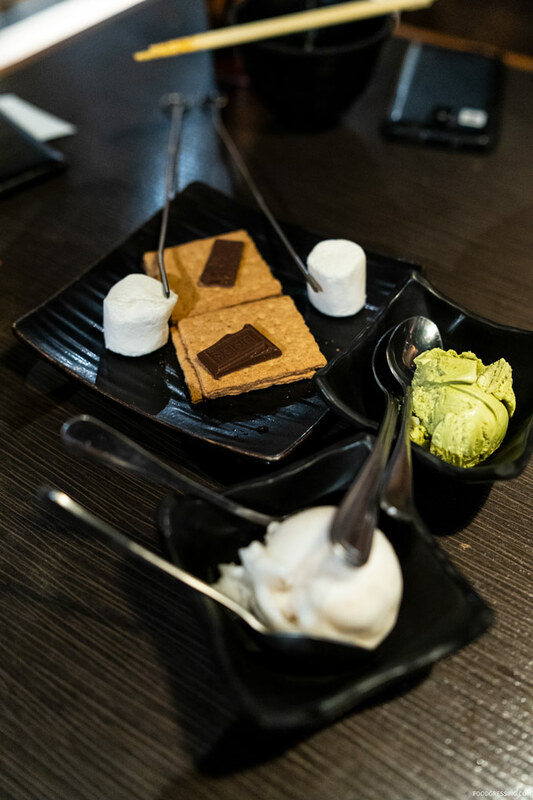 For dessert, there were S’mores and choice of ice cream. 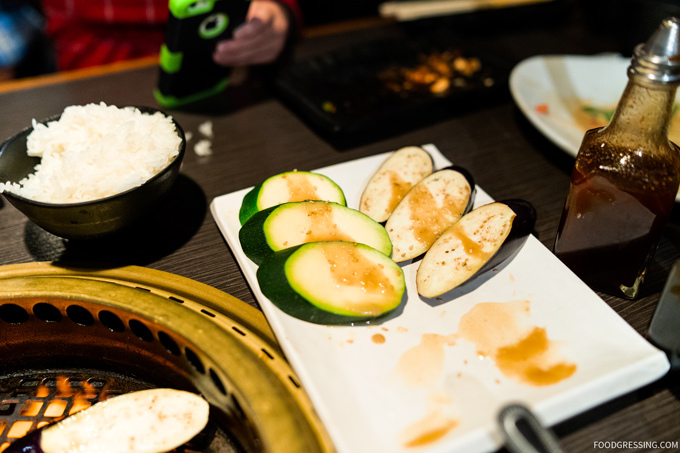 We went with Green Tea and Lychee. The service was pretty good considering how busy it was. All the dishes were brought to us in a timely manner. 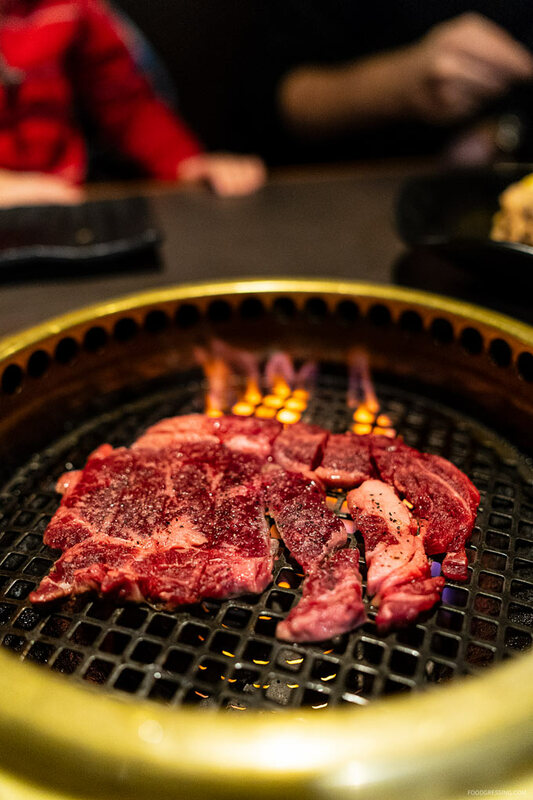 Gyu-Kaku also has an app where you can earn points towards rewards after each meal. 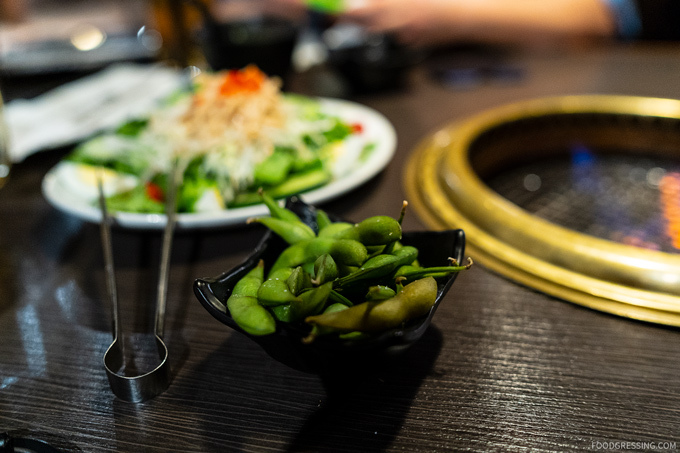 For rewards, you can get free dishes (like Shrimp Garlic, Filet Mignon and so forth) and even $25 off your next visit. 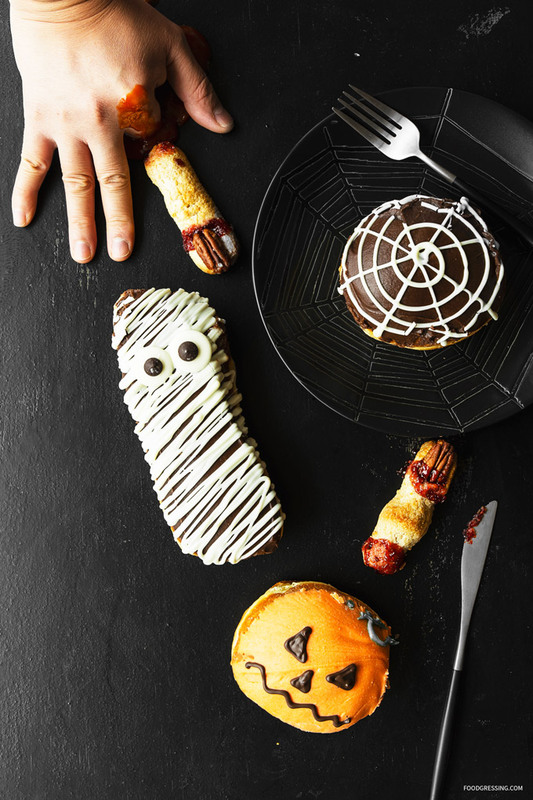 I picked up these Halloween goodies from Breka Bakery: Pumpkin Dule De Leche Donut, Long-John Ghost Donut, Chocolate Spider-Web Donut, and Finger Cookies. Hope you had a spooktacular Halloween! 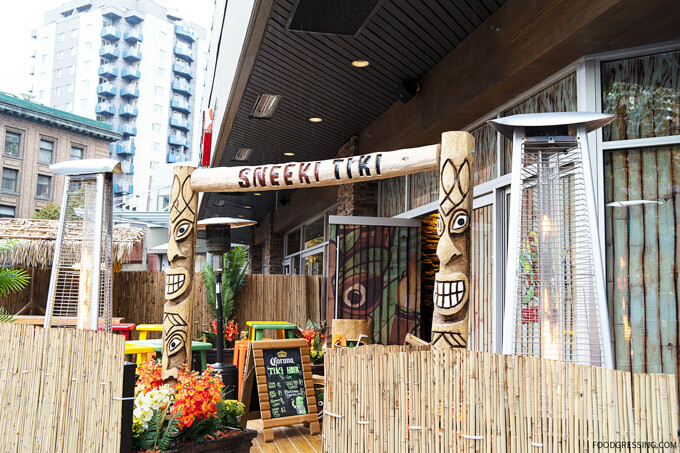 Say “Aloha” to Sneeki Tiki, Vancouver’s newest Tiki experience located on Granville Street in Downtown Vancouver. 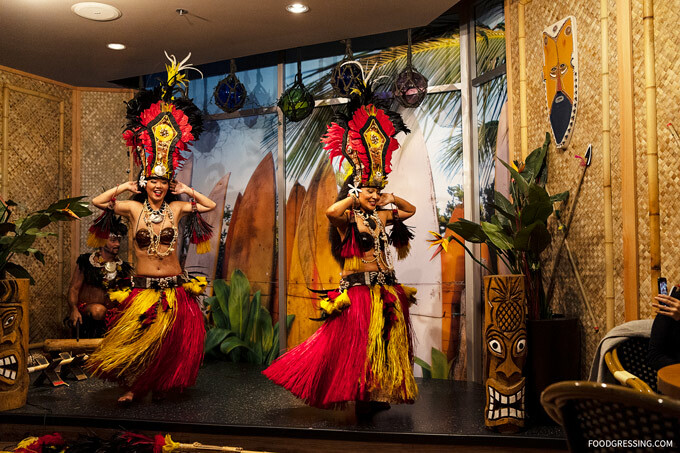 Inspired in part by tiki carvings and mythology, Tiki culture began in the United Stations and is a 20th-century theme used in Polynesian-style restaurants and clubs. 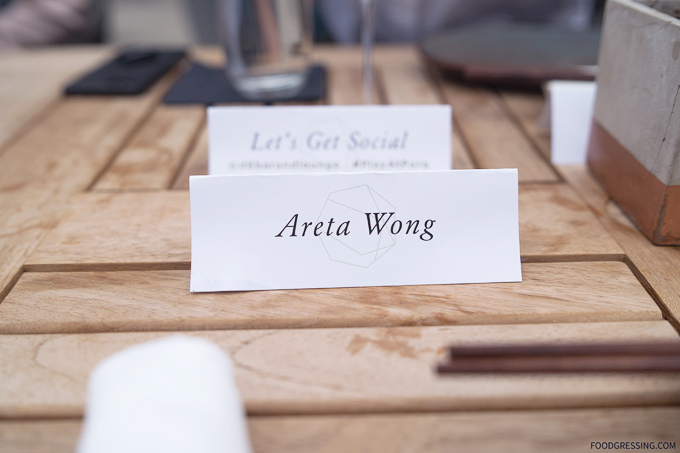 Disclosure: I was invited to a media event where all food and drinks were complimentary. Opinions are my own. 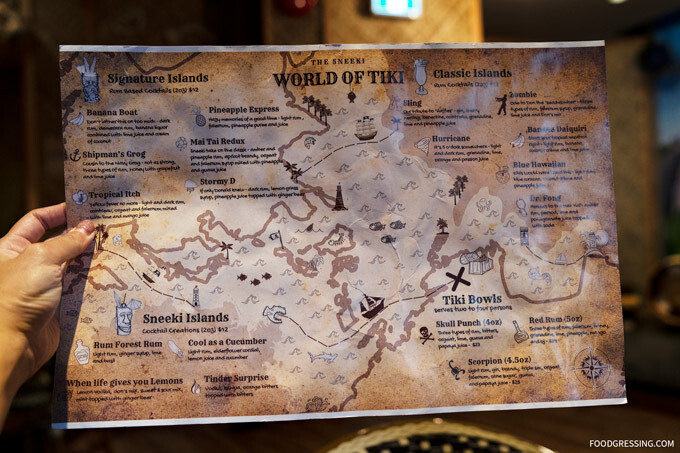 At Sneeki Tiki, you will be transported to a tropical paradise with their Tiki-inspired drinks and food menu. 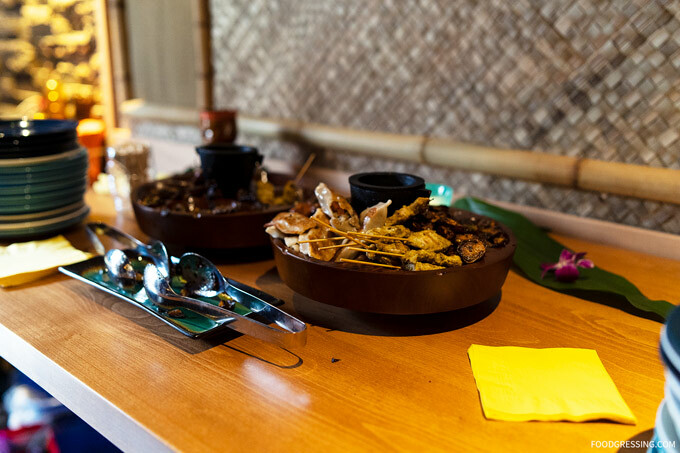 I was invited to a media event at Sneeki Tiki. Here’s a look at what you can expect. 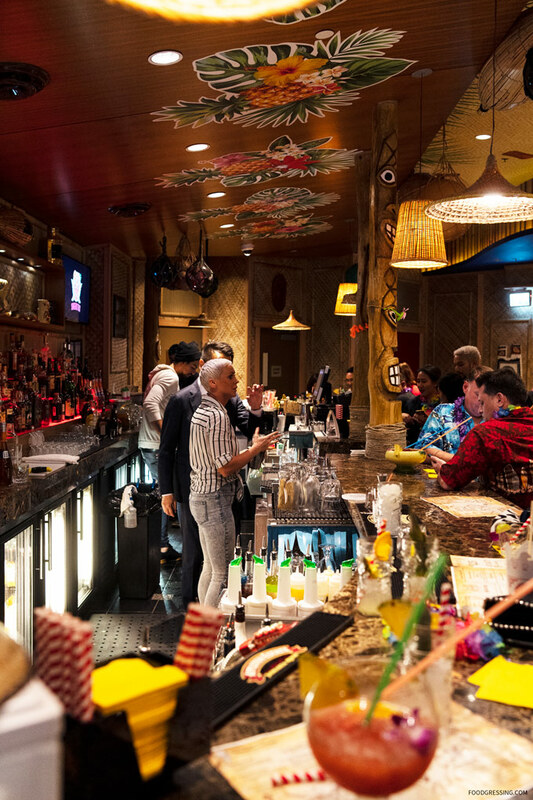 For drinks, Sneeki Tiki offers Signature and classic rum-based cocktails, Tiki Bowls to be shared between 2-4 people, Sneeki Cocktail creations, draft beer and wine. 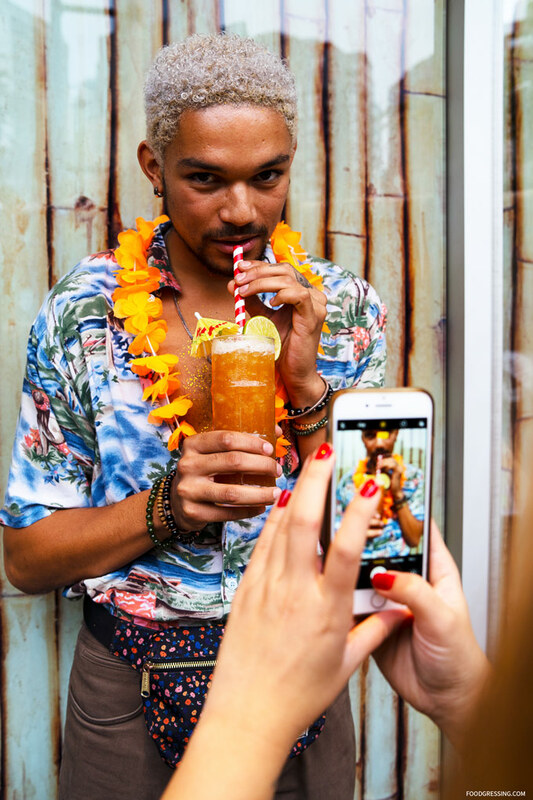 Banana Daiquiri (light rum, banana, cream of coconut and lime juice), Pineapple Express (light rum, falernum, pineapple puree and juice), and Stormy D (dark rum, lemon grass syrup, pineapple juice topped with ginger beer). 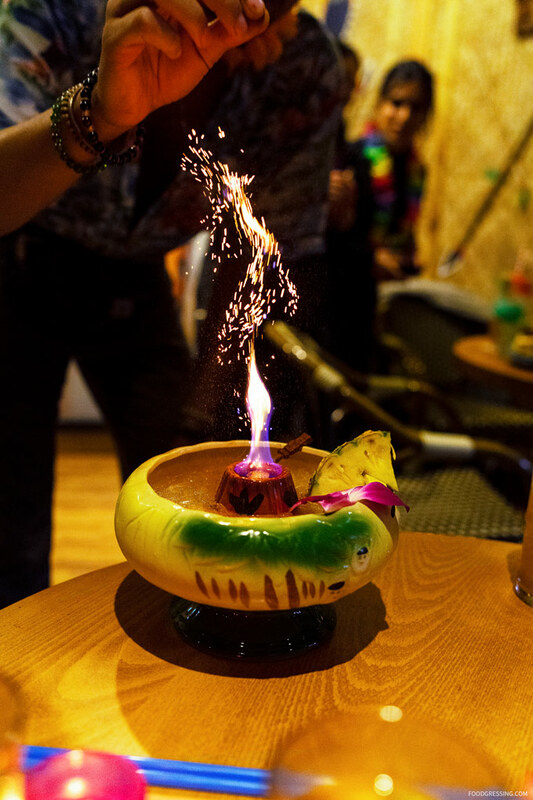 We orderd the Scorpion Tiki Bowl featuring light rum, gin, brandy, triple sec, orgeat, falernum, cane sugar, guava, and papaya juice. 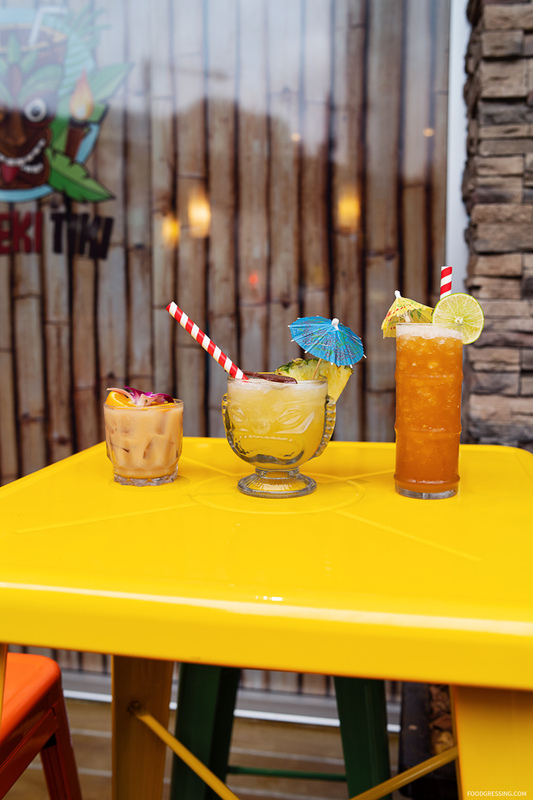 To accompany these drinks, Sneeki Tiki has a menu of Island-inspired eats with a twist. 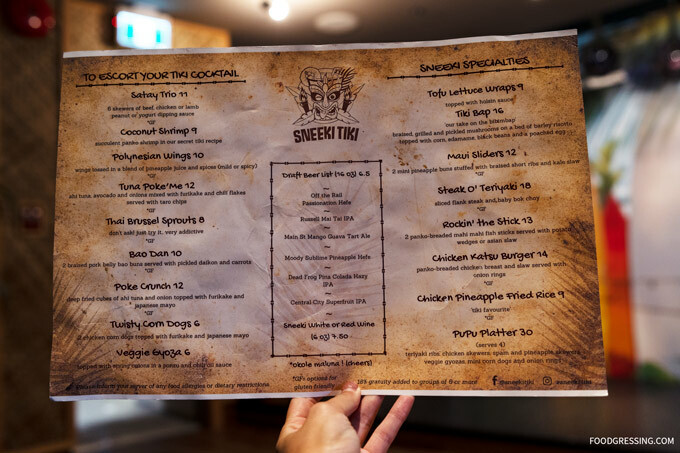 There are Maui Sliders featuring 2 mini pineapple buns stuffed with braised short ribs and kale slaw, the Tiki Bap (their take on the Korean bibimbap) and the Rockin the Stick ( mahi mahi fish sticks panko served with potato wedges or asian slaw) and so forth. 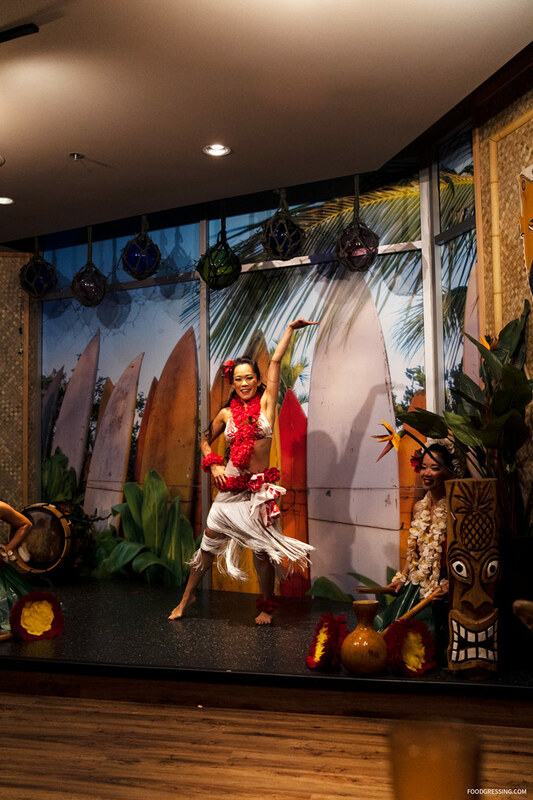 Polynesian dance and live music will also be featured at Sneeki Tiki on select dates and times. 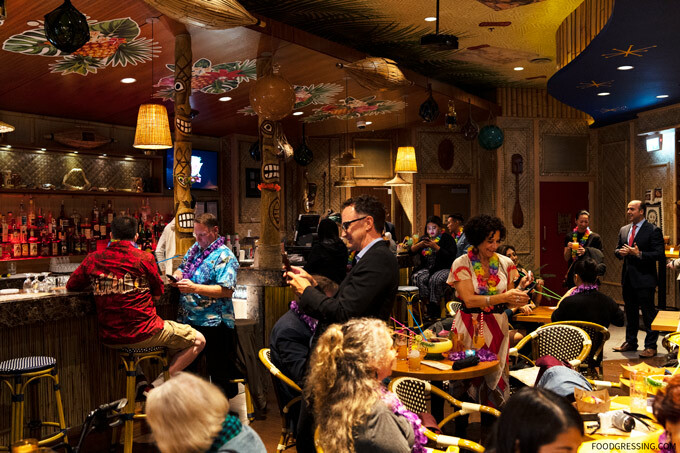 For a funky, playing and unique experience, Sneeki Tiki might be worth checking out. 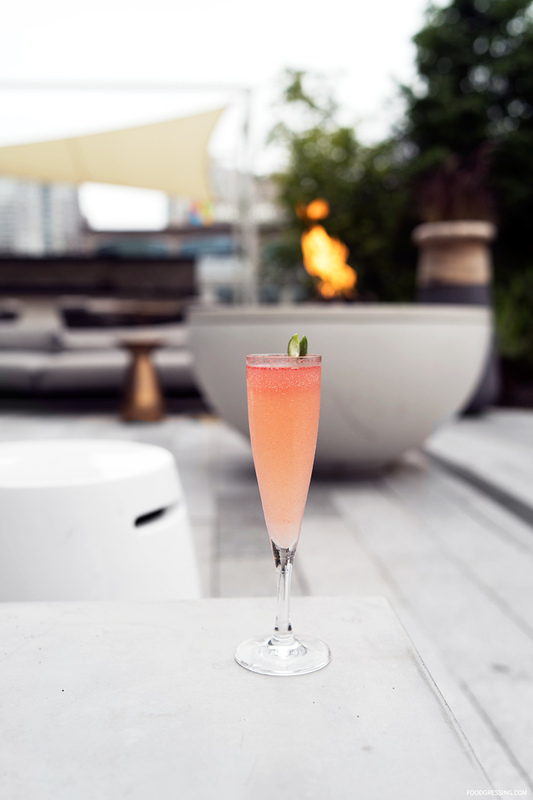 One of the most exciting new restaurant openings that took place last year was Botanist at the Fairmont Pacific Rim. 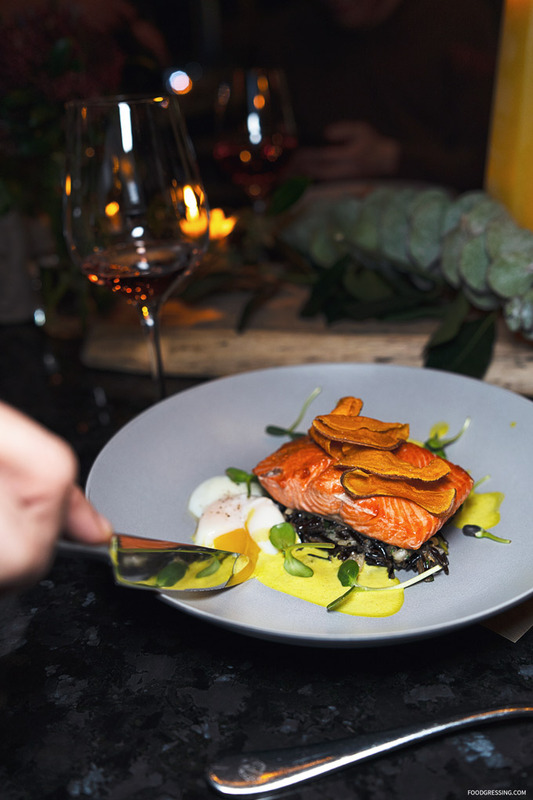 The restaurant showcases the botany of British Columbia from a culinary perspective. 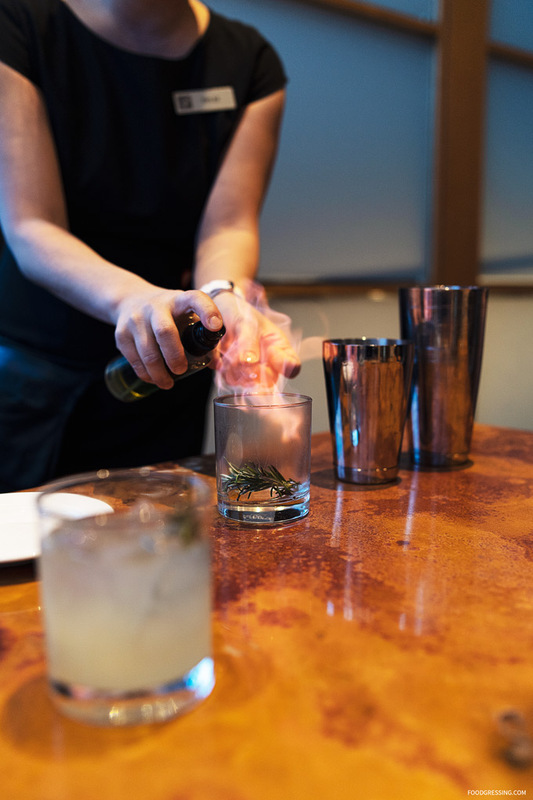 Botanist is open 7 days a week for breakfast, lunch and dinner and features a cocktail bar and lab, garden, dining room, and champagne lounge – all inspired by the principals of botany. 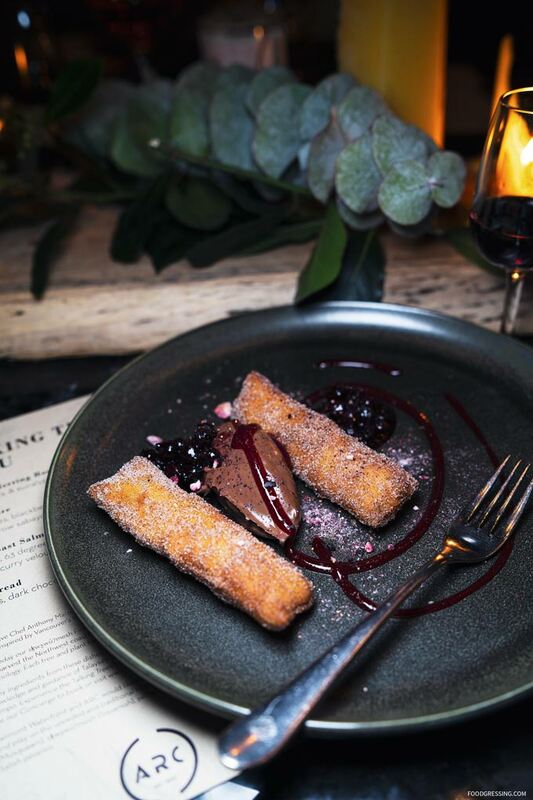 Last December, Diana (foodology.ca), David (pickydiners.com) and I visited Botanist to try their multi-course dinner tasting menu priced at $108 per person. Note: This is not a sponsored post. 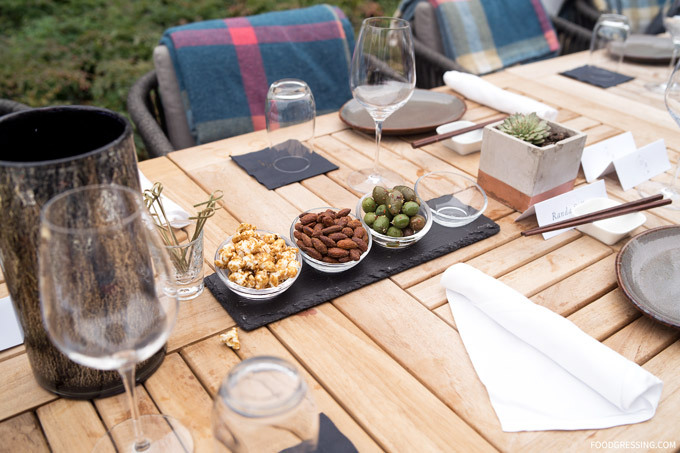 The food and drinks were not complimentary. Opinions are my own. 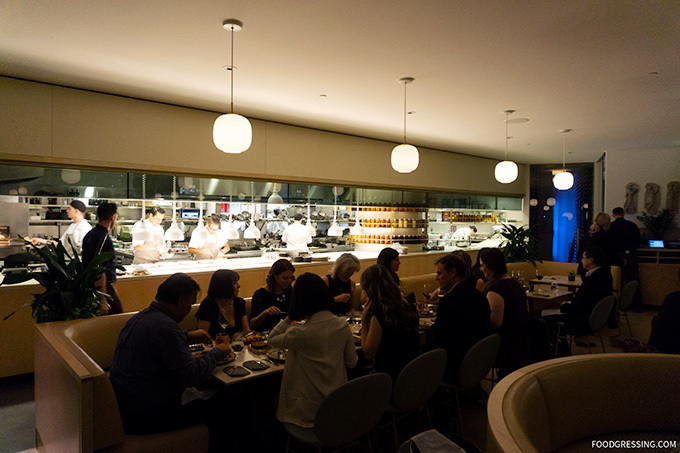 We came in on a Friday night for an 8 pm reservation and the restaurant was buzzing. 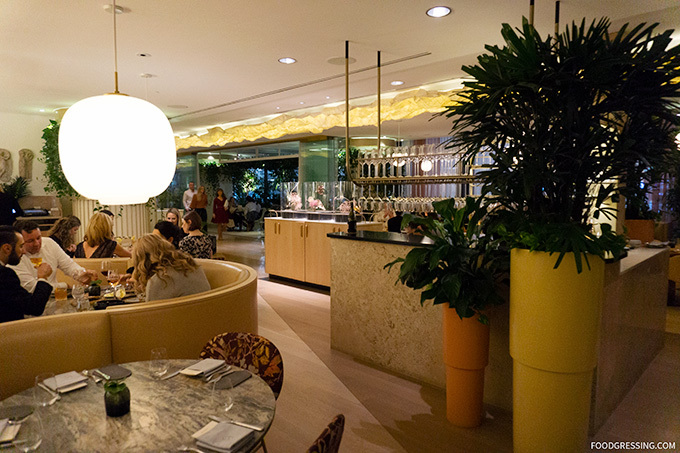 The lighting was dim in the main dining area which was a contrast to the well-lit open kitchen. To start, I had the Not Yet, a spirit-free drink featuring carrot, beet, ginger, lemon and sparkling water. 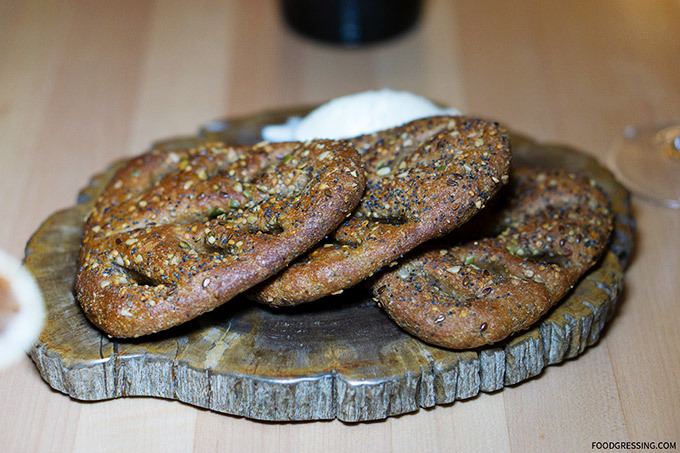 We then received a complimentary order of bread topped with herbs and seeds. 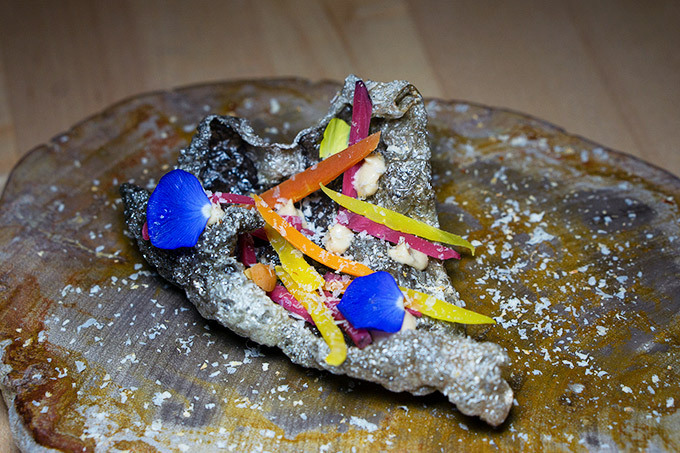 With a vibrant presentation, the crispy, crackly dried sturgeon chicharron with fermented vegetables was a great start. 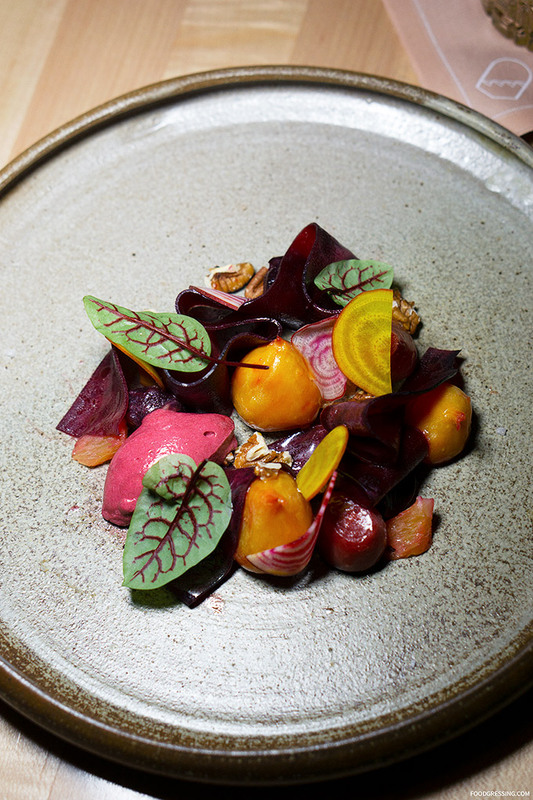 We were then presented with a salad made with beets, pecans, oranges, and Ashley’s Goat cheese. 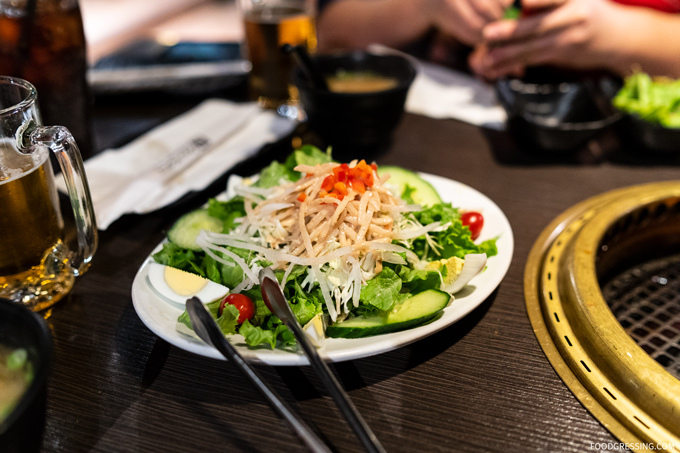 The ingredients were fresh and flavourful and the arrangement of the salad was very pretty. 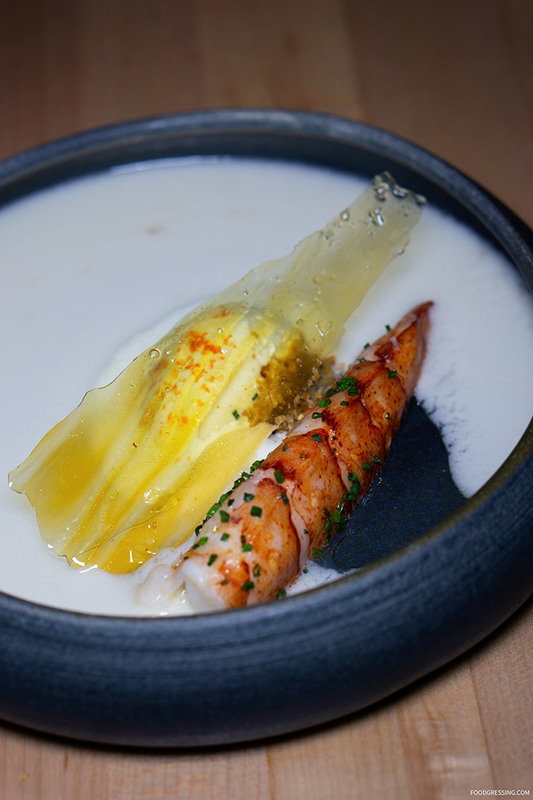 Next was the lobster with a sunchoke veloute and chive chantilly. 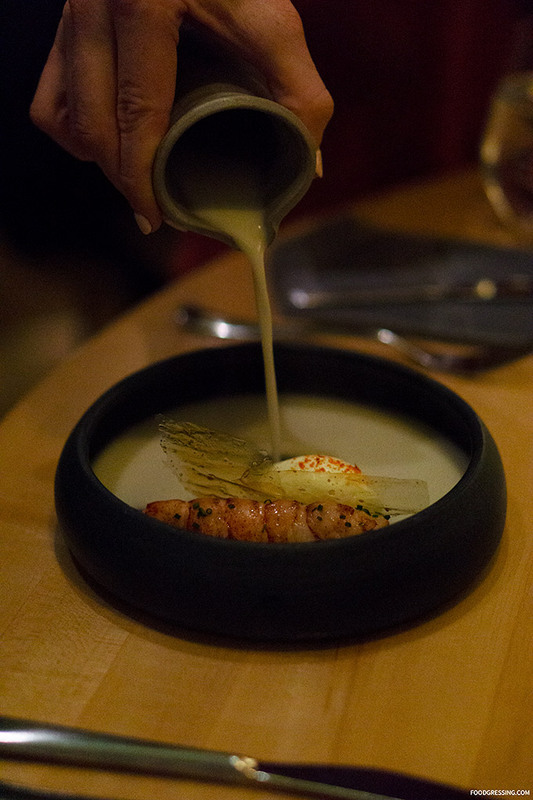 The buttery, tender and juicy lobster went well with the creamy, nutty and smooth lobster veloute. The diver scallop was seared perfectly and was very tender. 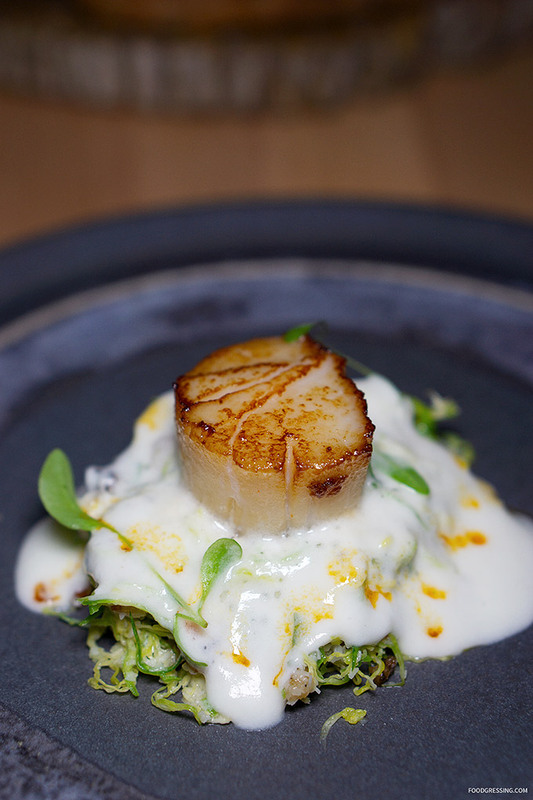 It was accompanied by Brussel sprouts, guanciale (Italian cured pork) and celeriac foam. 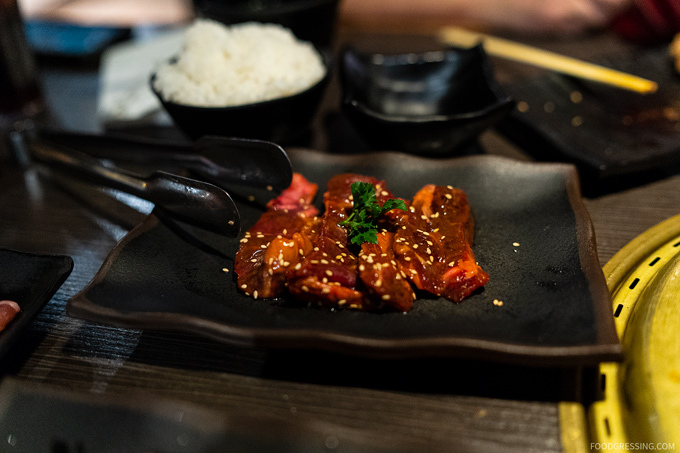 Our fourth dish was the bison which was lean, slightly gamy, slightly sweet. At this point, we were getting pretty full but we pushed on! 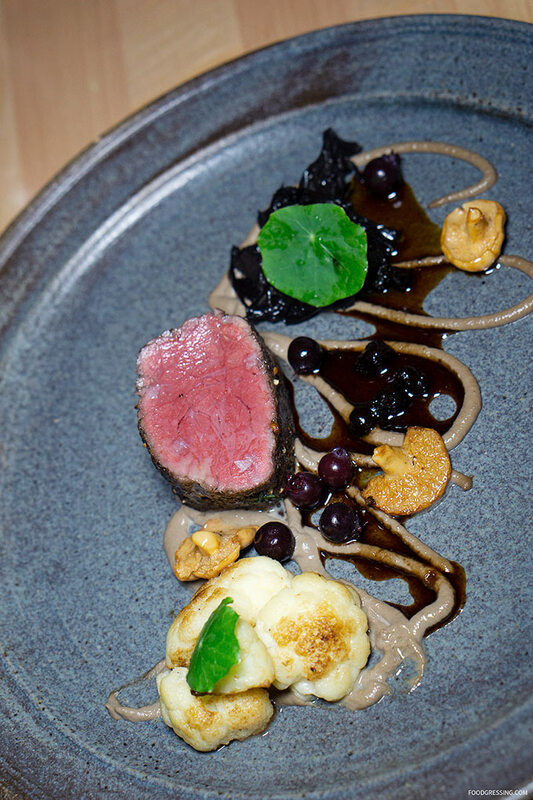 The meat was accompanied by Saskatoon Berry which added to the sweetness, mushrooms and cauliflower. 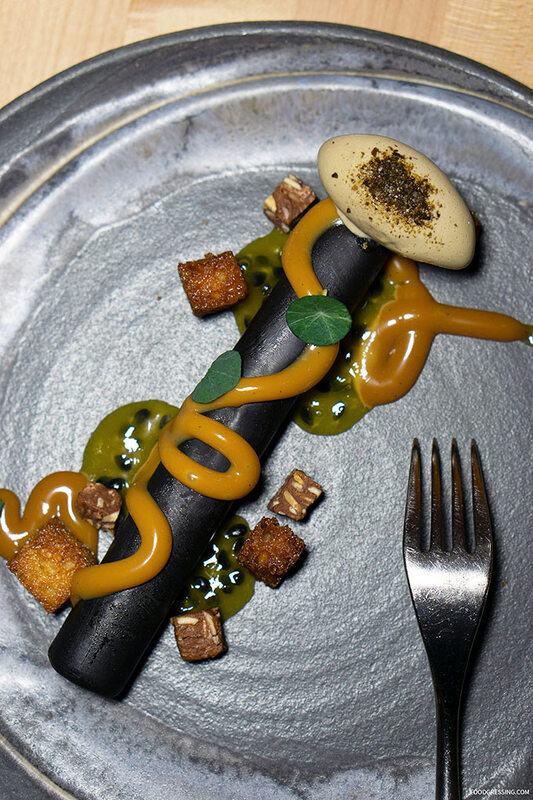 For dessert, we had the Hakuju chocolate pate, passionfruit pulp and licorice ice cream. 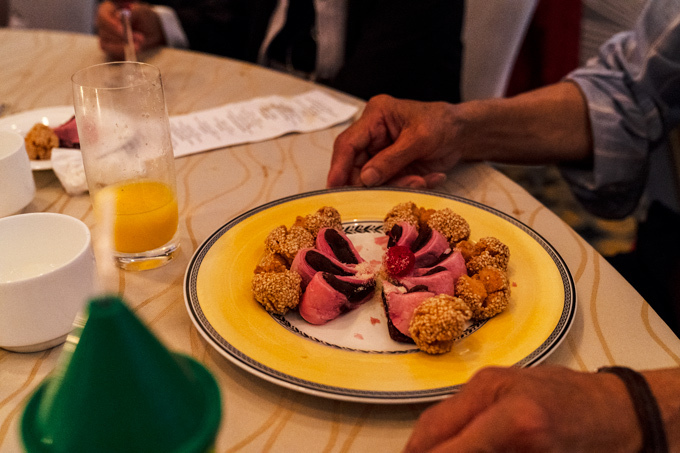 It was a creative dessert with a unique presentation that had sweet, bitter, salty and sour flavours. The server for our meal was stellar and she explained all the dishes wonderfully. 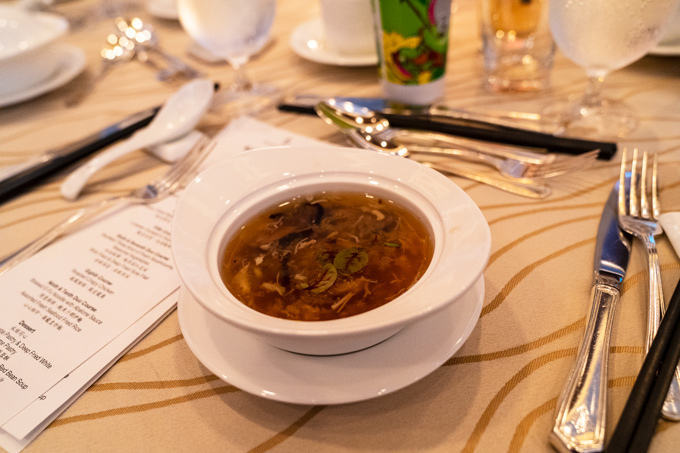 The pace of our multi-course meal was also on point. 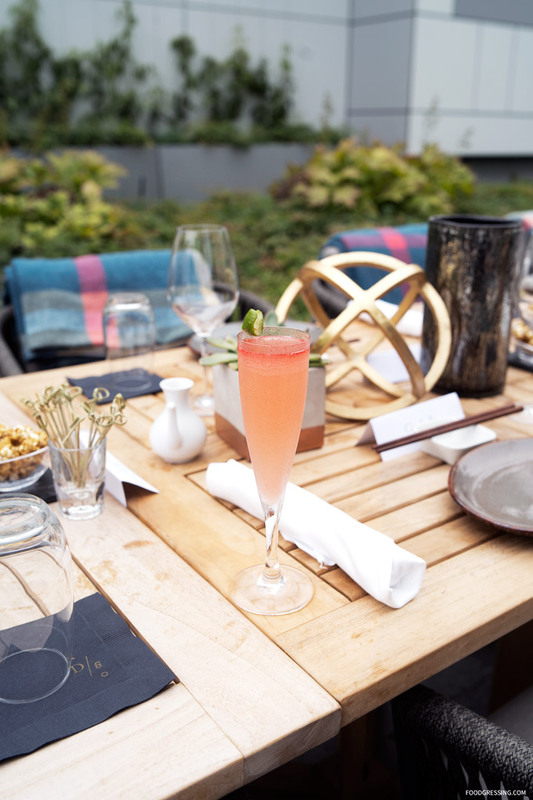 The sun is shining and there’s no better way to spend summer in Vancouver than sipping cocktails on a rooftop patio. 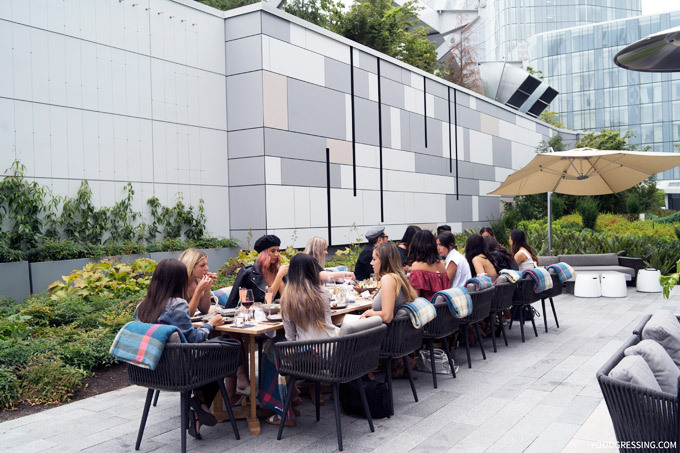 The patio at D/6 Lounge and Bar in Parq Vancouver is now open for all-day dining (11:30 am – 9:30 pm). 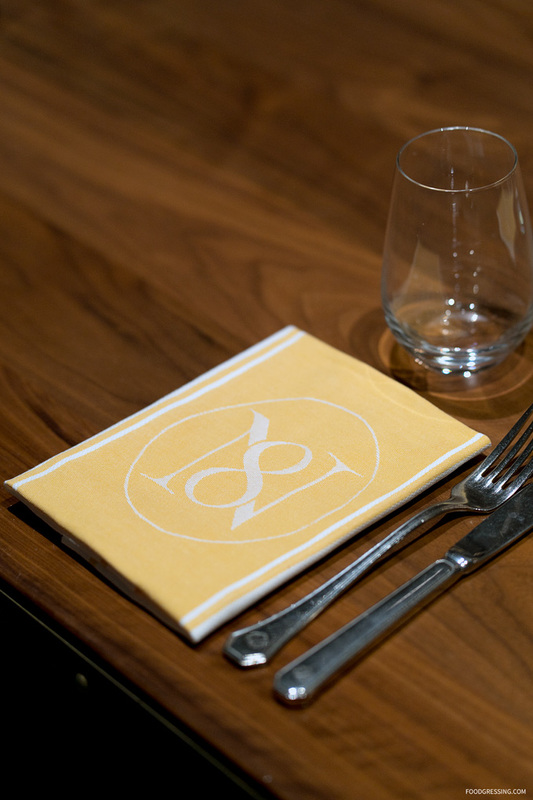 Whether it’s lunch with a laptop or a lavish affair with your crew, D/6’s thoughtful all-day fare menu works for any occasion. 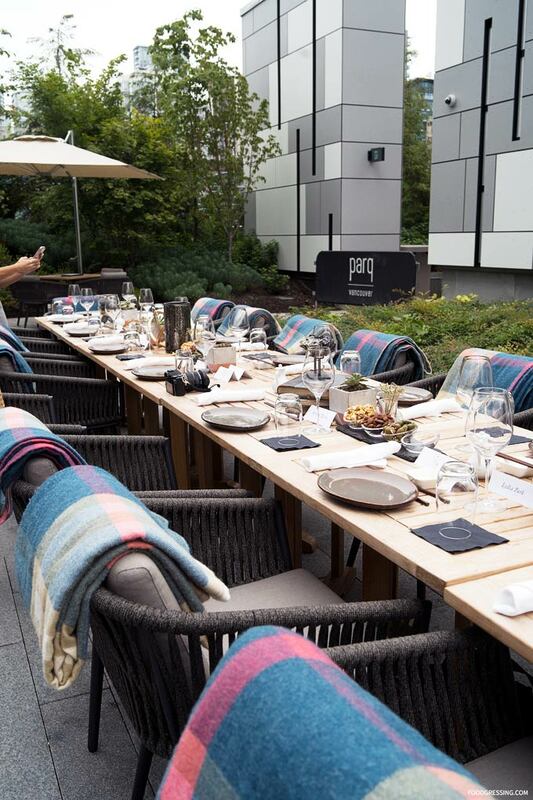 I was recently invited to long table lunch at D/6 Bar and Lounge. 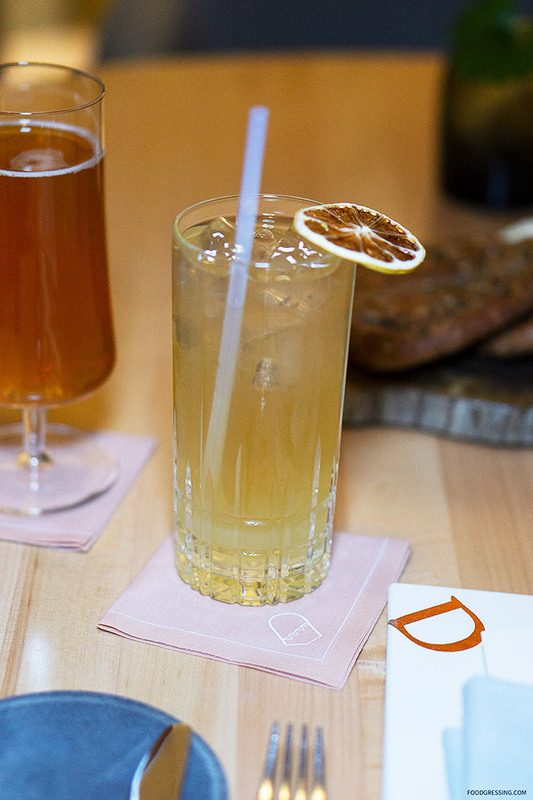 Here’s a look at the delicious eats and sips I enjoyed. 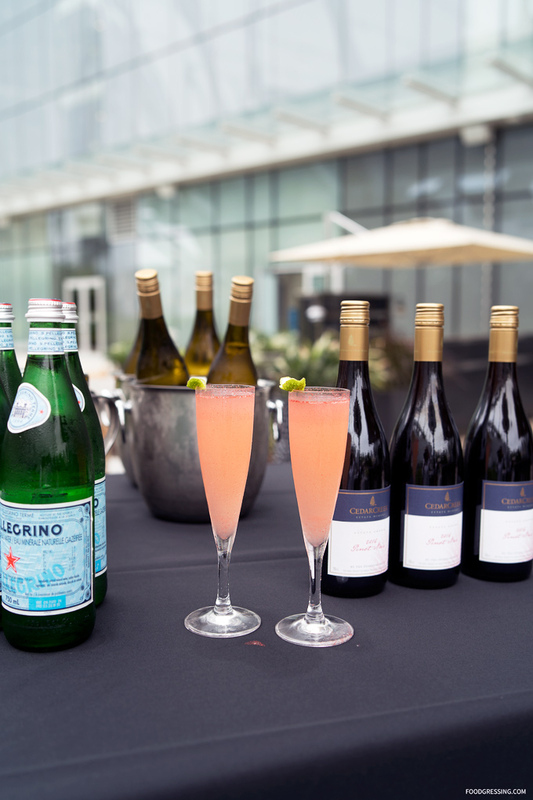 Disclosure: All food and drinks at this media event were complimentary. 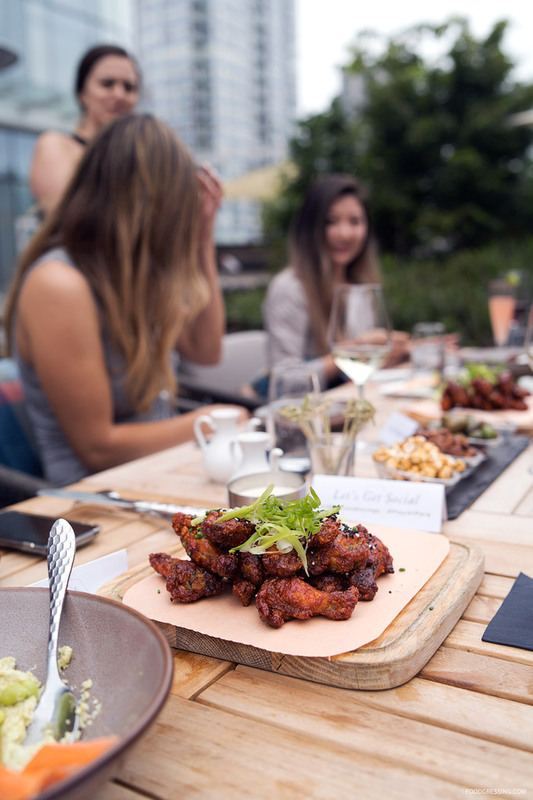 Perched beneath the eaves of BC Place on the 6th floor of Parq Vancouver, D/6’s patio is a great place to enjoy cocktails al fresco. 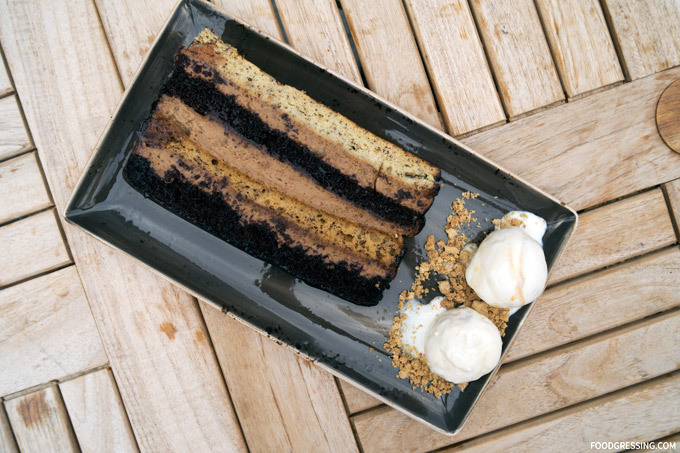 Society Chocolate & Banana Cake: caramelized bananas, milk chocolate mousse & dark chocolate glaze ($12). Available at Honey Salt. 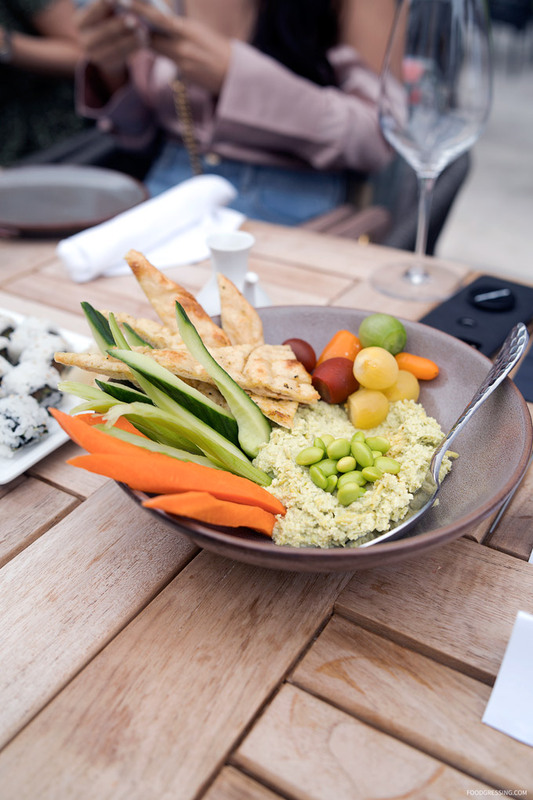 My favourites from the luncheon were the Trio, Edamame Hummus, Chicken Wing Bar, Farmstead Greek Feta Salad, and Pride Cake. 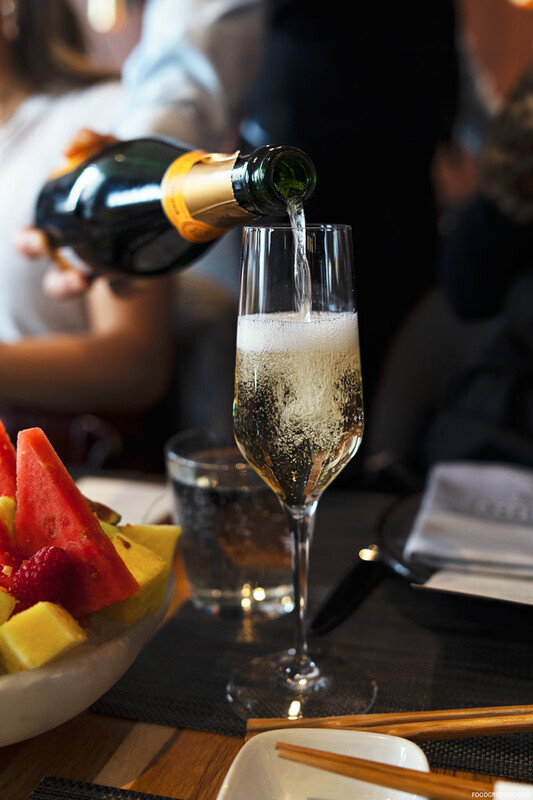 Taking part in weekend brunch is a decidedly indulgent and wonderful way to enjoy your time off. 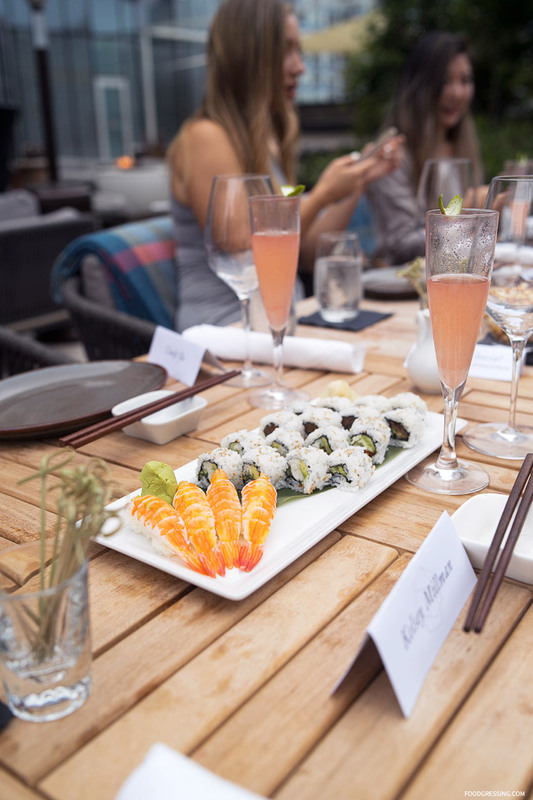 At Notch 8 Restaurant located inside the Fairmont Hotel Vancouver, weekend brunch is a delicious affair with Chef-led action stations, hot and cold offerings and a decadent dessert bar. 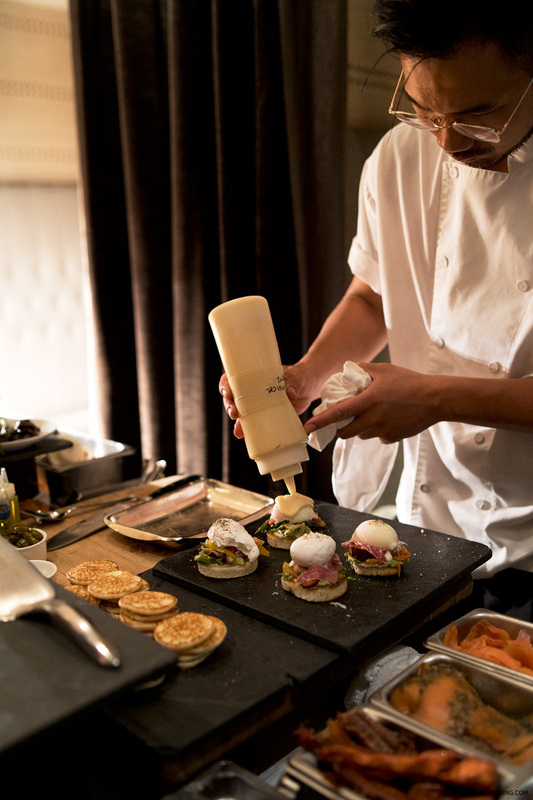 The brunch is available on Sundays from 11:30 am to 2:30 pm; adults $59 and $29 for kid 12 and under. 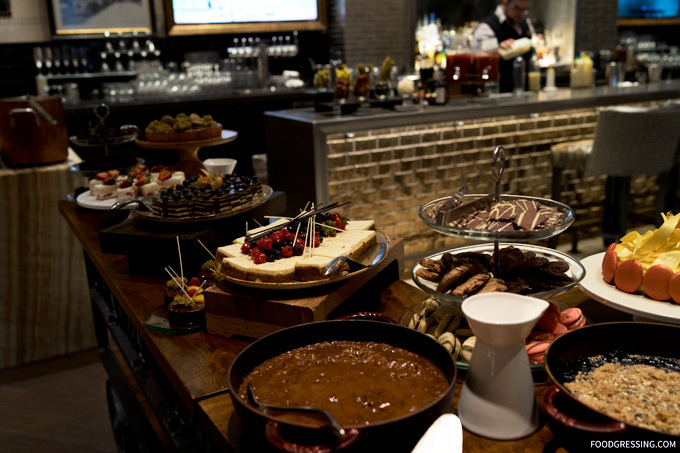 Having enjoyed Notch 8’s breakfast buffet, I was excited to try Notch 8’s weekend brunch. Here is a look at my experience. Disclosure: I visited Notch 8 as media where my meal was complimentary. Opinions are my own. 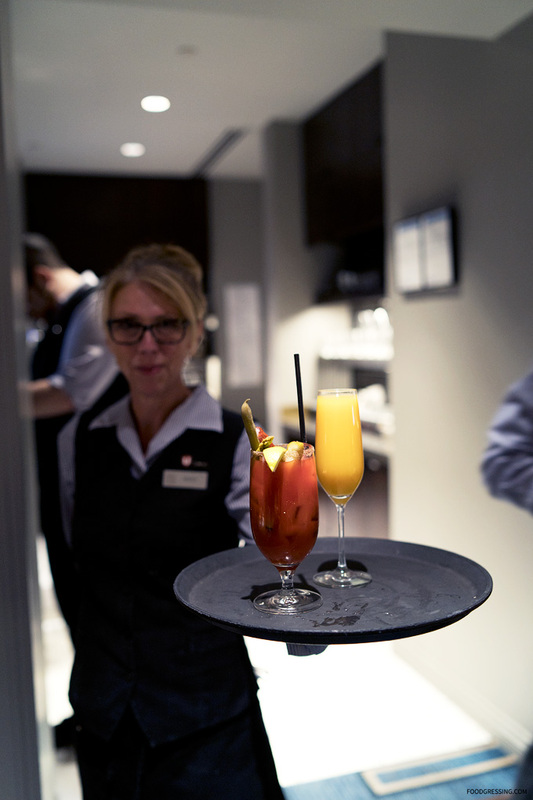 To start, diners can choose from either a mimosa or Caesar cocktail as part of the buffet. 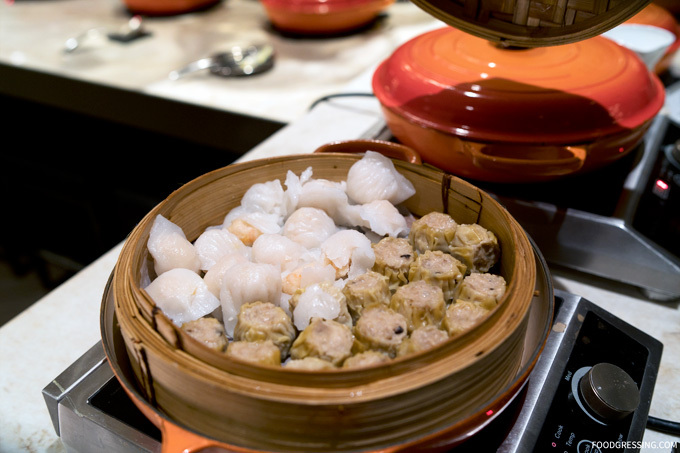 The buffet has a variety of offerings and is organized into different sections. 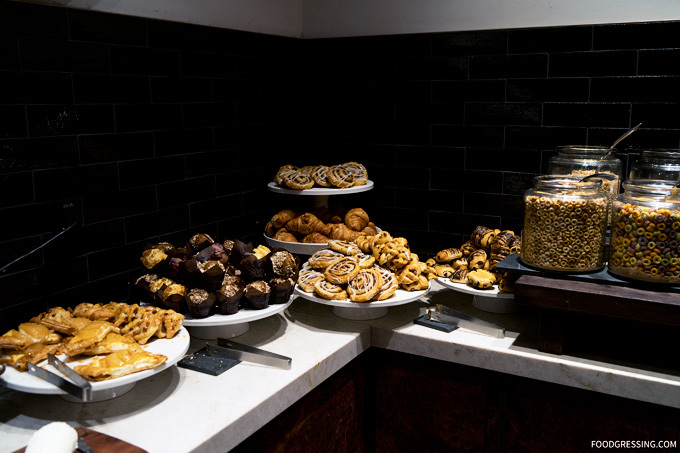 The pastry section features rustic artisanal bread, cereals, fresh pastries, juice, smoothies, whole fruits as well as carved fruits. 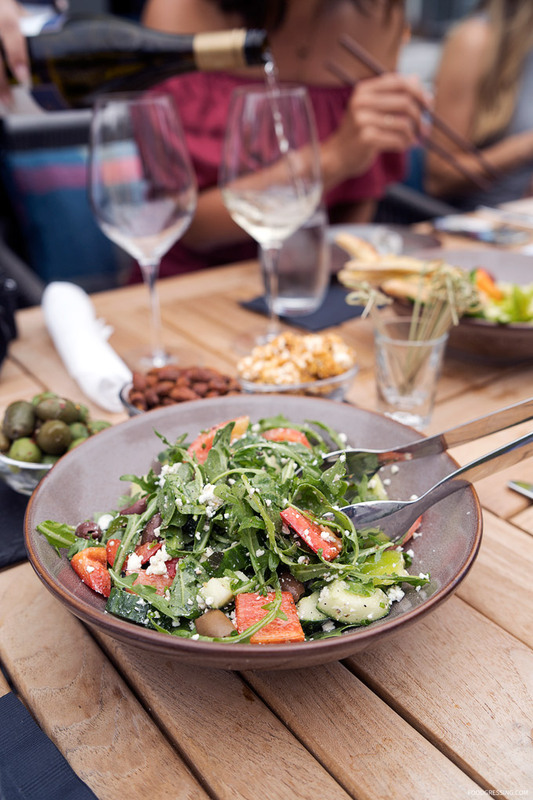 Some of the cold offerings include coconut chia seed pudding and salads (like heirloom tomato bruschetta salad). 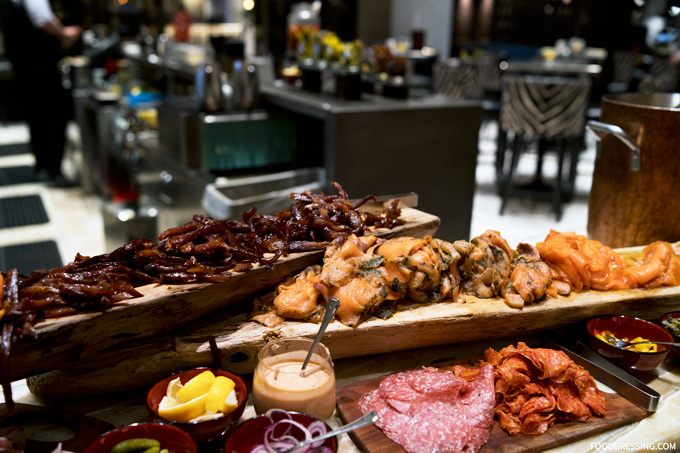 The charcuterie section features cheese boards as well as seafood platter with hot smoked salmon, sockeye candied salmon and cold smoked prawns. 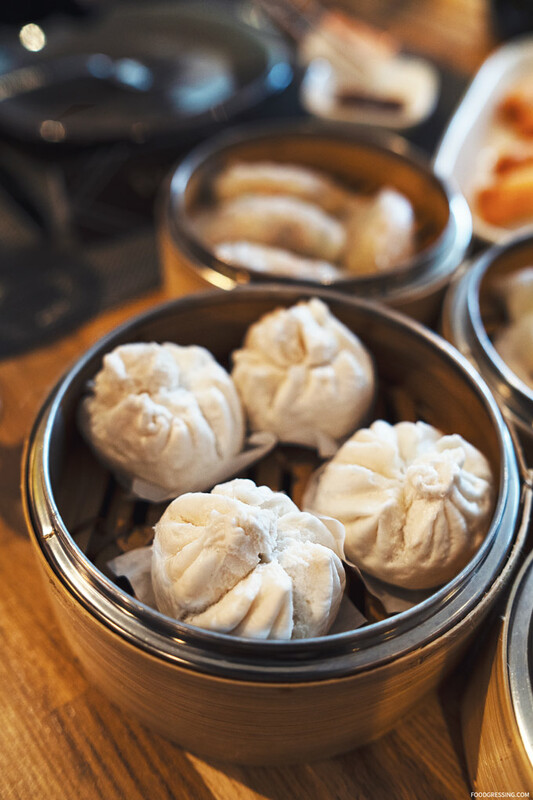 Hot offerings are aplenty and include steamed dumplings (like har gaw and siew mai), French toast, wild salmon frittata, Canadian Bacon Benedicts, Porchetta Hash and more. 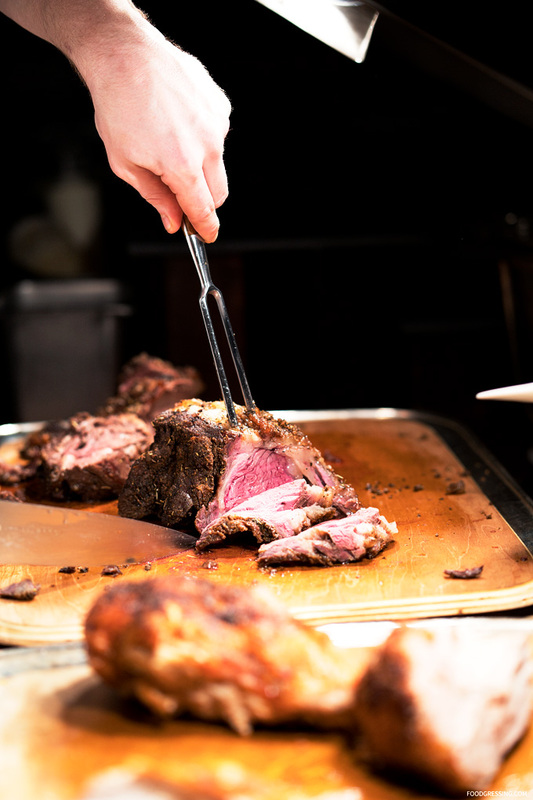 At the carving station, you’ll find classic prime rib, the feature rotisserie (it was Turkey when I was there) as well as Yorkshire Pudding and gravy. 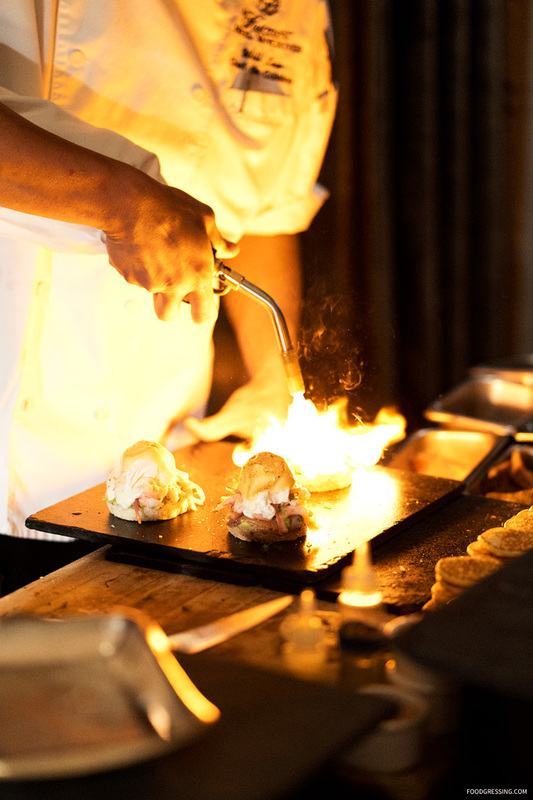 It was very entertaining to watch Chef Will create my customized Eggs on Toast creation complete with a fiery torching. 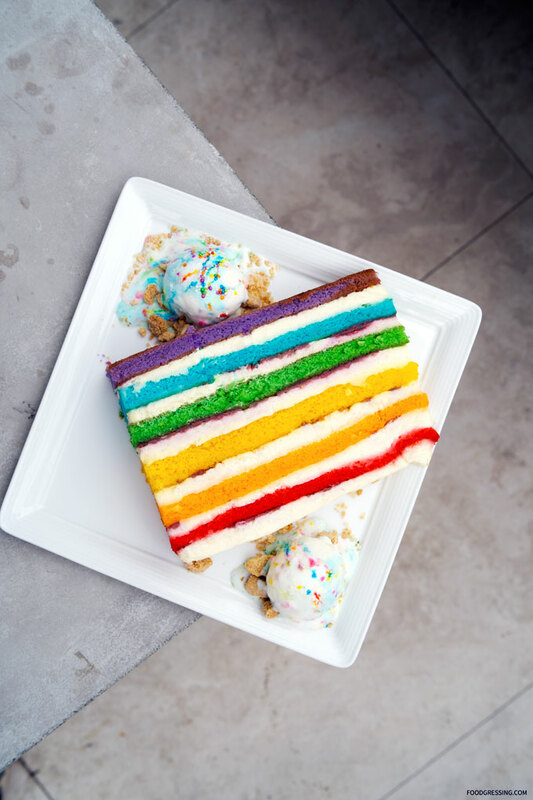 The drool-worthy dessert bar comes complete with a decadent selection that includes strawberry cake, pumpkin bundt cake, crème brulee, pecan pie, sticky toffee pudding, blueberry crumble, the OMG cake, cheesecake. 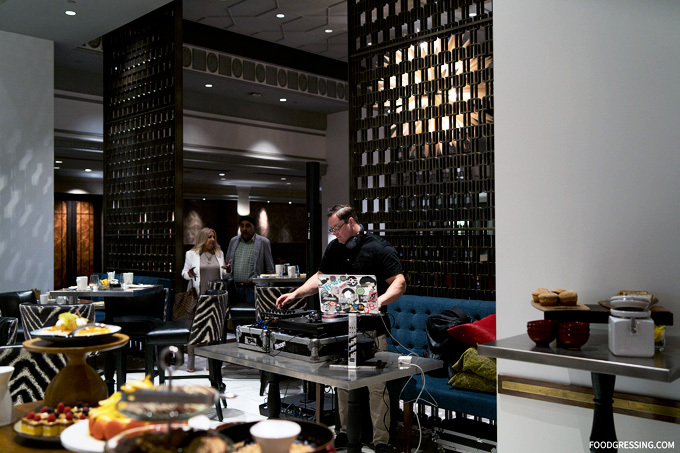 Diners can also enjoy music from a live DJ. 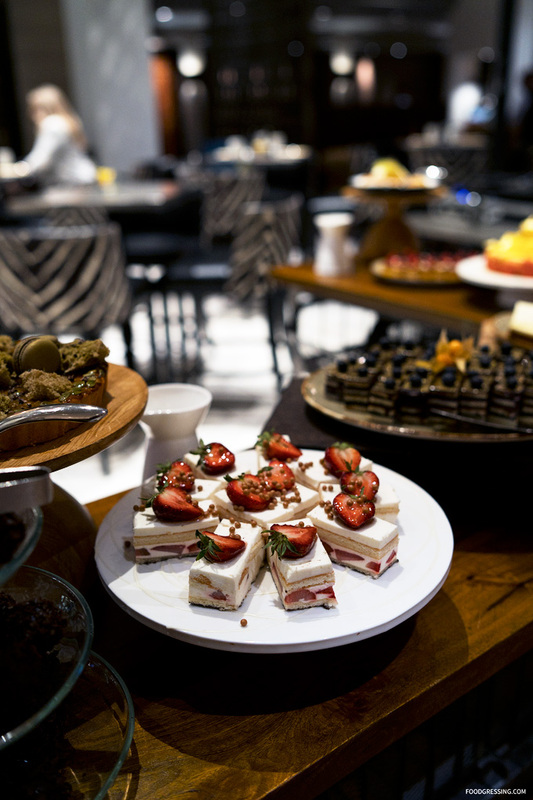 I certainly enjoyed the sweet and savoury offerings at Notch 8’s decadent brunch buffet. 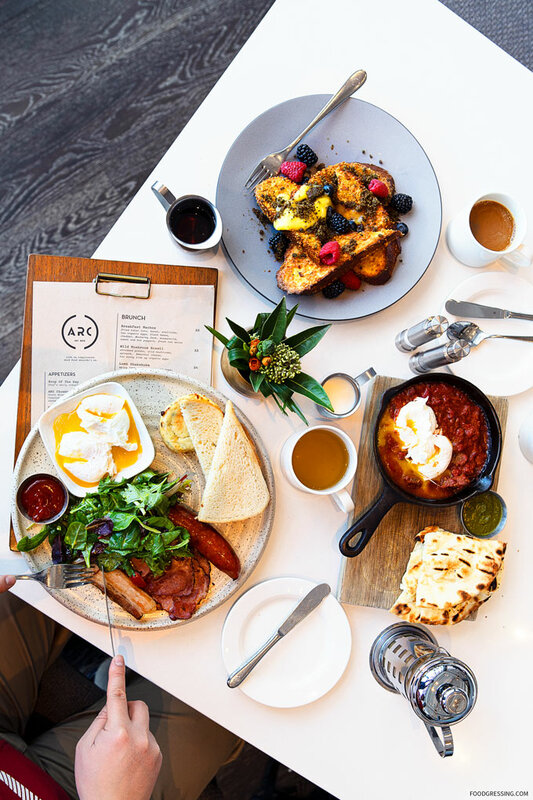 The weekend brunch buffet at Notch 8 is a great way to gather with friends and family over delicious food in a warm and inviting environment. 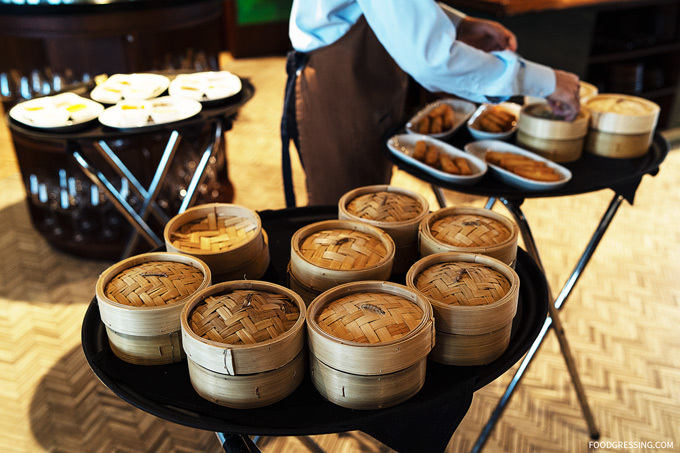 I would love to revisit in the future and would recommend the buffet to others. 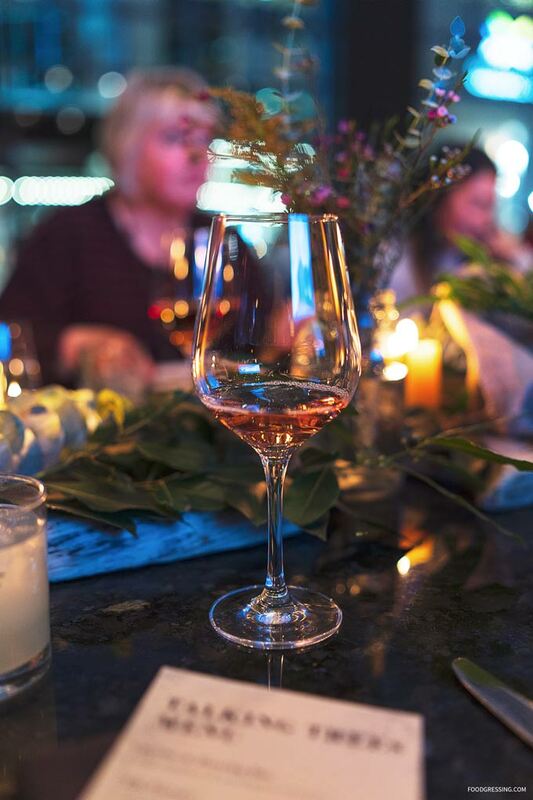 For reservations or more information, 604-662-1900 or email hvc.concierge@fairmont.com.